I recently took a challenging contract for American Association of Family Physicians (AAFP) and I have been putting in some challenging hours, first getting up to speed and now working on the project. It has NOTHING to do with crafting – thank heavens – else I fear I would stop doing crafting altogether. Crafting and sewing and quilting have become my mode of decompression after a long day sitting in front of a computer. There is nothing more rewarding than handling fabric or sanding wood… something that brings me back to life after working in a digital world all day. The weeks haven’t been entirely without crafting, but more from the standpoint of collecting the basics for future projects. For one, I bought myself another embroidery machine – a Singer Quantum XL-6000 – and can’t wait to get it up and running. This makes the fourth quantum series machines that I own, and I have head over heels for all of my Singer machines. Unfortunately, the latest one arrived needing a bit of servicing and I figured that I would get it tuned up at the same time. I finally picked it up Wednesday and barely had time to get it into the room. 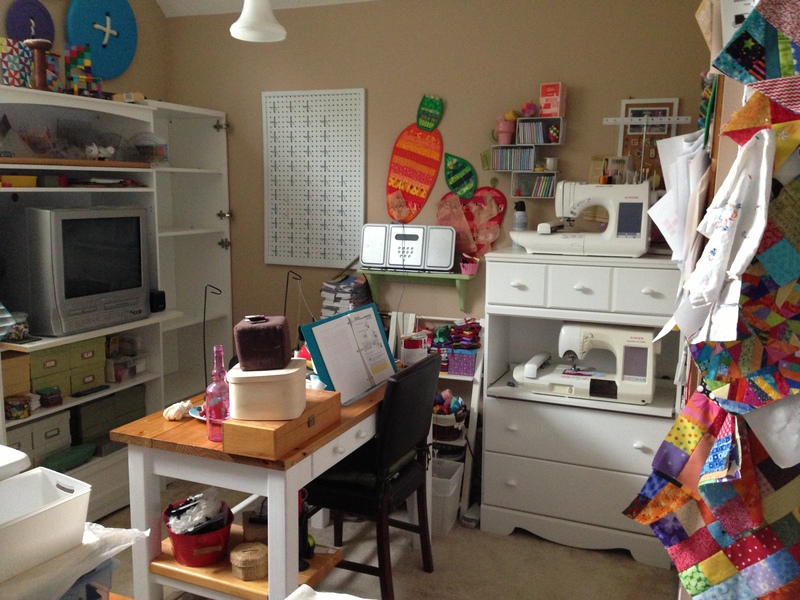 Because I have two embroidery machines – and I plan to use both – I had to rethink my sewing/crafting room. Finally after much hunting and planning, I have a solution. 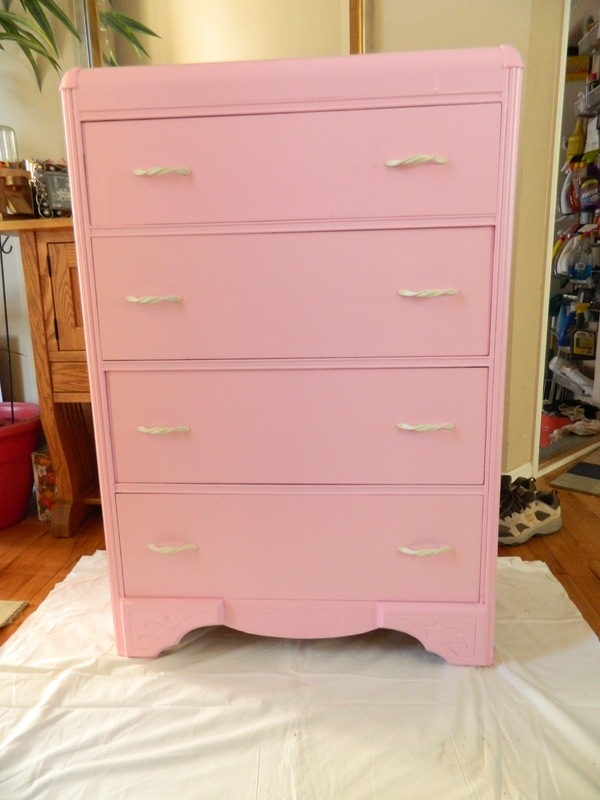 I took a nice new tall chest of drawers and removed the second and third drawers and added a pull out drawer. With help from the bestest kid in the whole world (how did I get so lucky to have such a considerate and loving son? 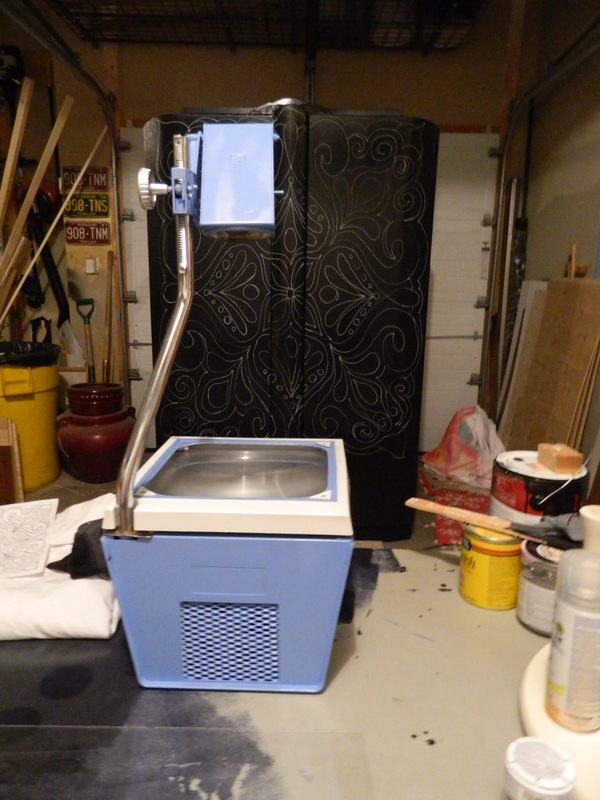 ), we got it done and in place the day before I picked up the machine from the repair shop. This will give me all kind of storage for embroidery thread and stabilizers and all the attachments that come with these machines. 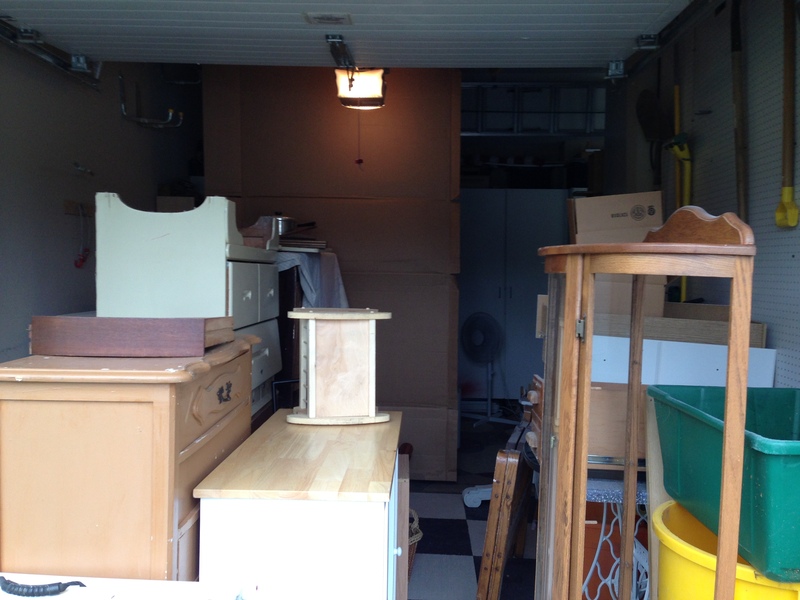 Of course the cabinet that had been there is now sitting in the garage awaiting some new plan. Everything that was stored in that had to have a new home, so I bought a new cabinet for the space between the television cabinet and the wall. Found the perfect one at the new IKEA that opened up and with a little modification, it will be the perfect addition to the room. Bottom line though, there isn’t one more square inch available for anything after this! As I look at this photo, I think I should do something different under my cutting table. Hmmm…. As you can see from both photos, there is a lot of organizing to be done. Sometimes I think being so organized is a curse, I think I spend just about 1% more time organizing than I do crafting, sewing and quilting! We spent last weekend making the extended trip to Witchita – about 3 hours southwest of Kansas City to retrieve some goodies from an estate sale. This weekend we are heading to Iowa on another of our abandoned house hunting trips. Give us a chance to do something different – something my son is interested in. It is actually called urban exploration and can include more than houses, but in our part of the country, there is a dearth of abandoned farm houses as small family farms are being bought up by commercial farming operations. It really is quite sad, but the reality of what is happening to the business of farming. I talk more about that on my other blog – if you’re even interested enough to check it out, it is MacCupcake.wordpress.com. That blog is the place where I talk about this next phase of my life where my main role is no longer “Mommy” and what it means and what I would like to do with my years. Anyway, those expeditions often result in finding some amazing finds – it is interesting to see what gets left behind – deemed no longer necessary or wanted. The third, smaller stall of my garage is packed with finds from these trips, estate sales, thrifting and CraigsList. Like if I work on this stuff every minute I am awake, I could never use everything that I have collected. I have always said when I die, my house is going to be one helluva estate sale! So, come back often, I promise to get more posted as I finish projects. And don’t forget to show the love, I like comments!! And My Favorite Status: SOLD! 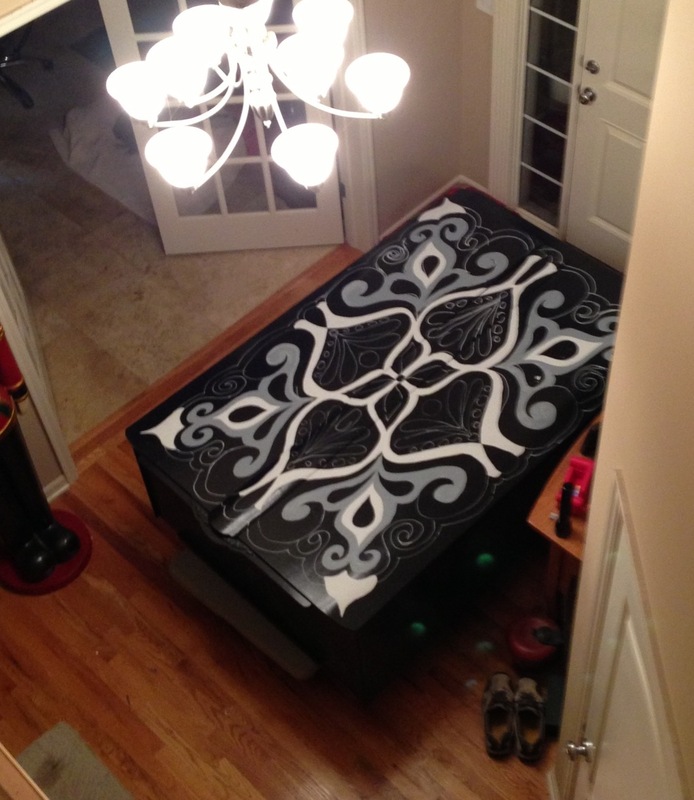 I finally moved one of the two behemoths out of my entry way and turned them into cash! Yay! The wardrobe has been finished for a while and I was beginning to wonder if anyone would find the makeover to their taste. 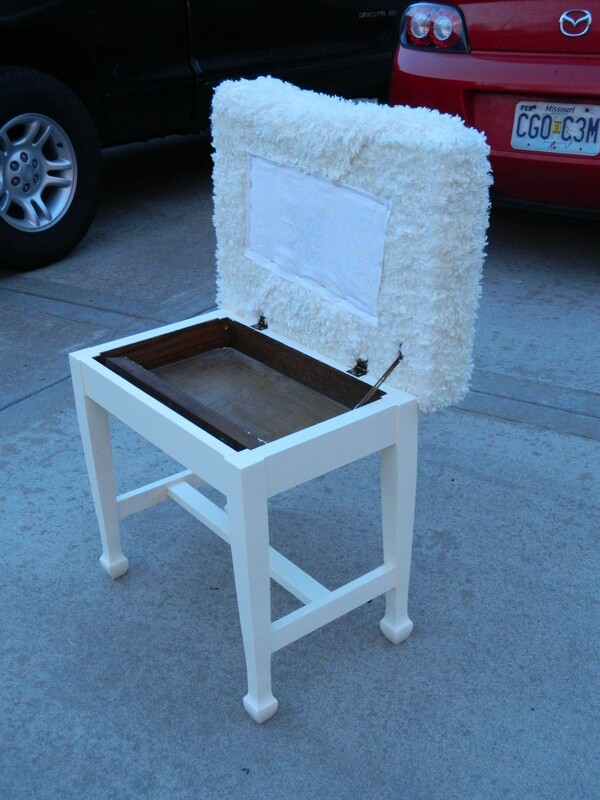 I was jockeying ways to actually keep it and make it the centerpiece of my entry way when I got the email. If you want to take a look at the previous blogs which described went into the restoration and painting of the wardrobe, click here. I happily helped load it into the back of their SUV in exchange for a tidy sum of cash. I like it when it works out that way. 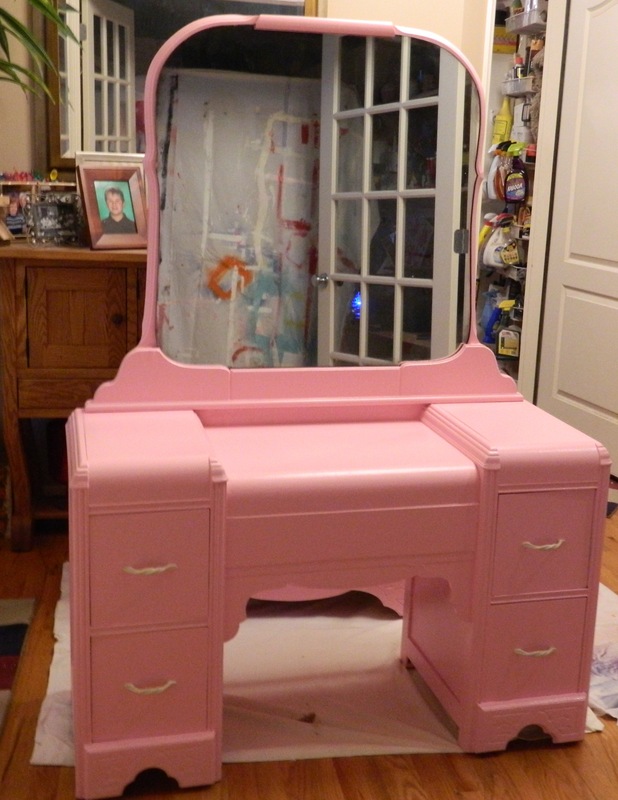 I also had just put the finishing touches on the off-white vanity and no sooner listed it for sale, then a lovely woman called to claim it for her daughter. I hadn’t even had a chance to post the finished pics here. 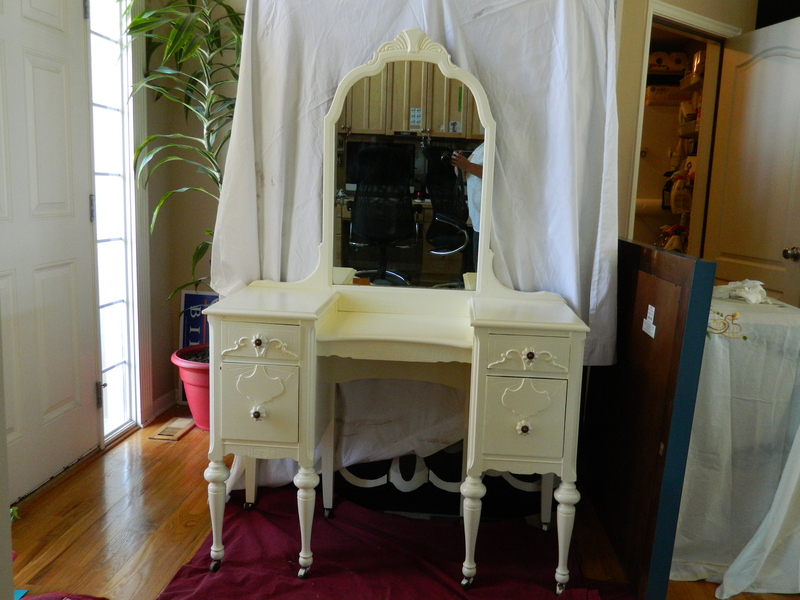 So, the vanity needed very little work, it was just in brilliant condition. A few minor fixes to the veneer, we (me and my trusty sidekick ‘The Kid’) attempted to replace the missing veneer pieces. It was good practice. 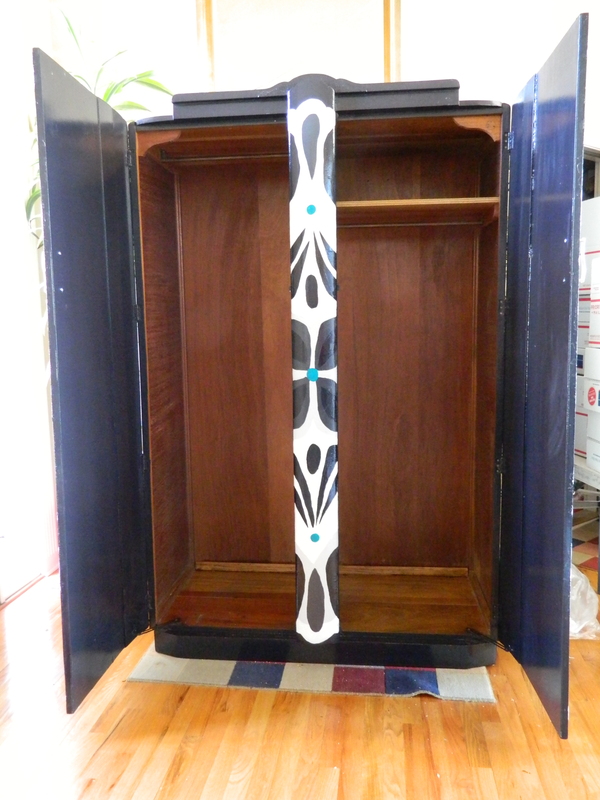 It turned out okay, but not spectacular, so I opted to go ahead with painting the entire cabinet. 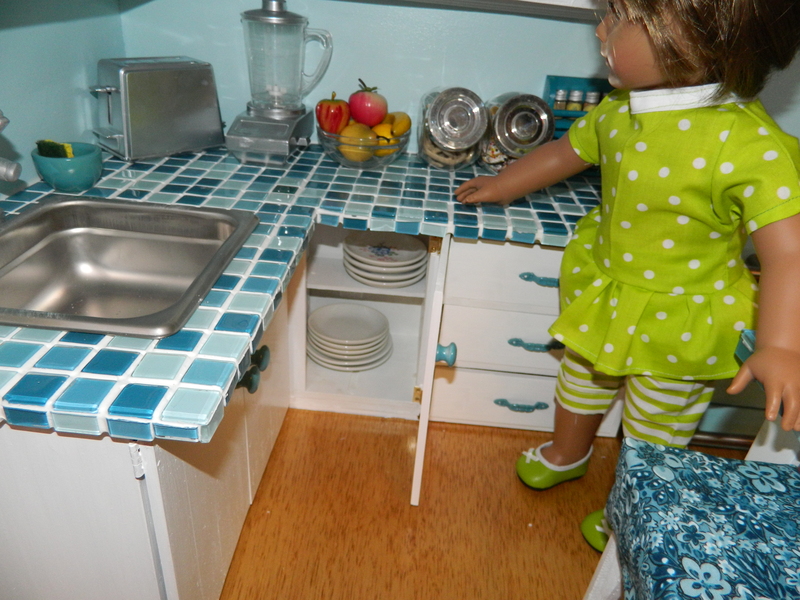 I loved the simplicity of the design on the drawers and mirror. 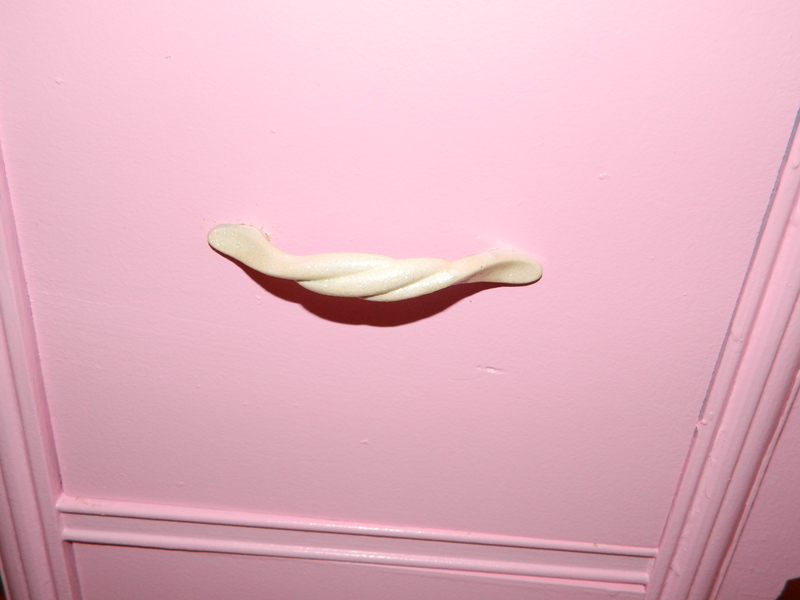 And of course, my new favorite color – Vanilla Custard – gave it an elegant look. 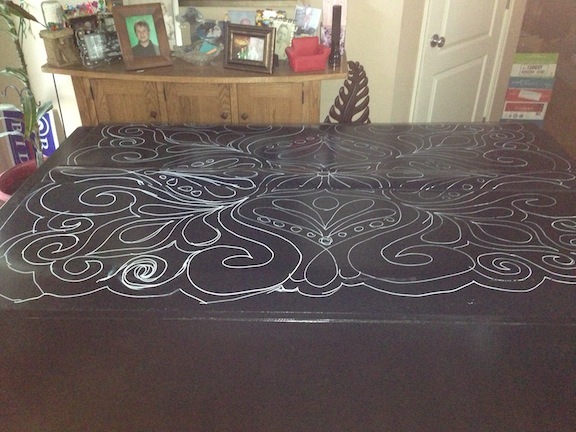 At the last minute, I came across an old piano bench, the top so warped and the veneer almost non-existent, that I opted to use along with the vanity. 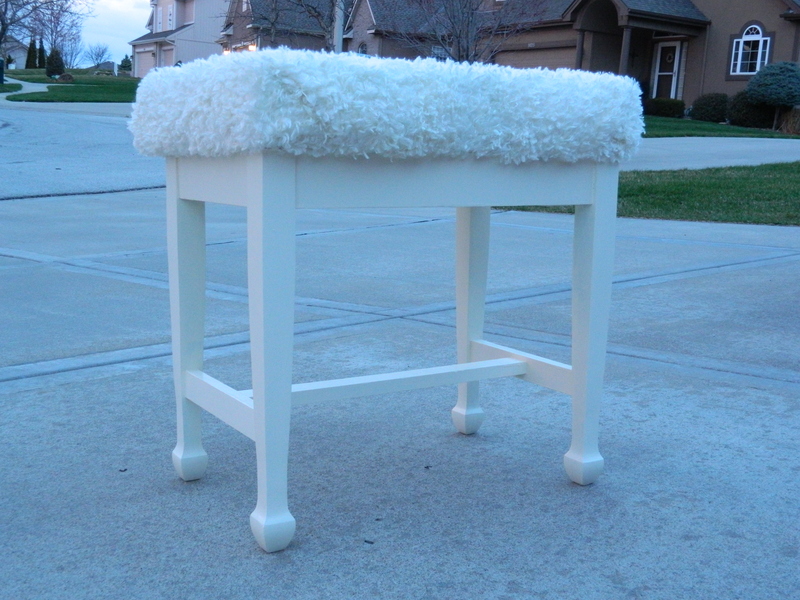 Apologies for the bad lighting, but I only had finished the bench before sunset and could take a quick snapshot before the buyer arrived. 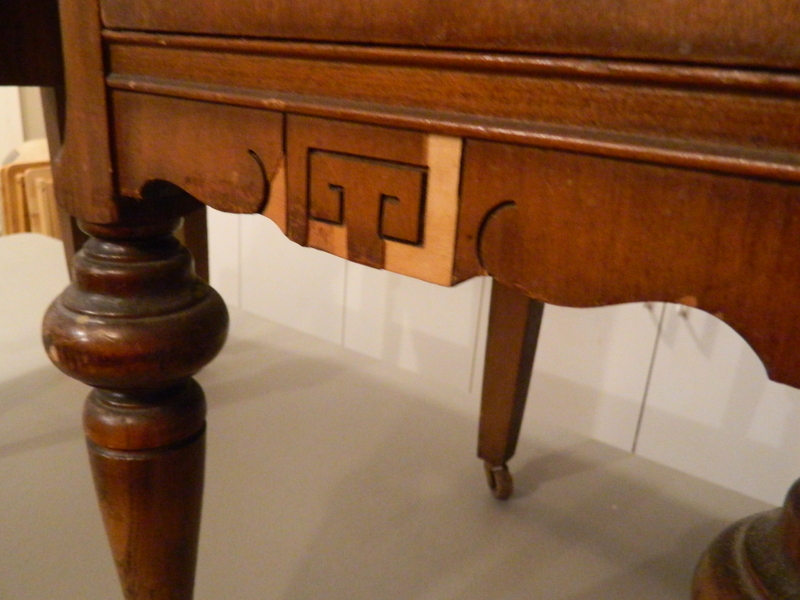 As it was a former piano bench, the top hinged up to reveal a little storage under the top. 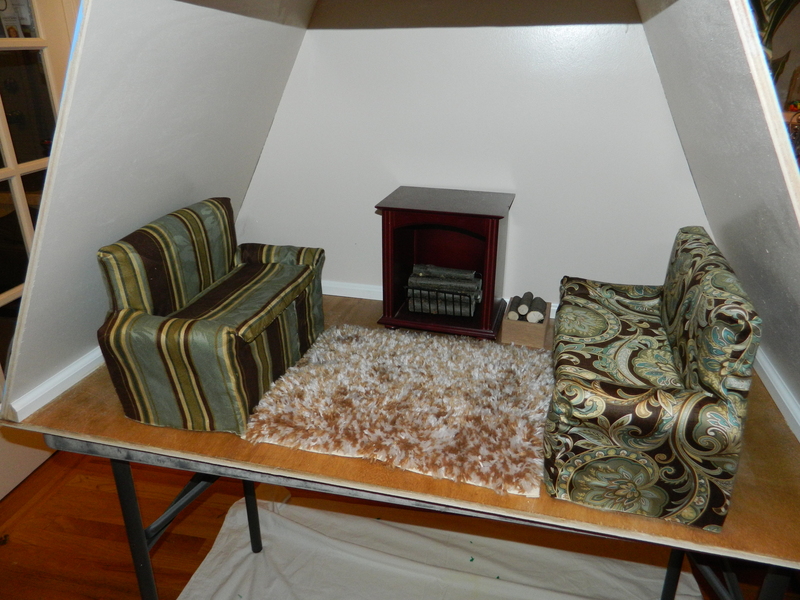 It was a simple job to add a piece of two inch foam and then wrap it with the softest velour I could find. 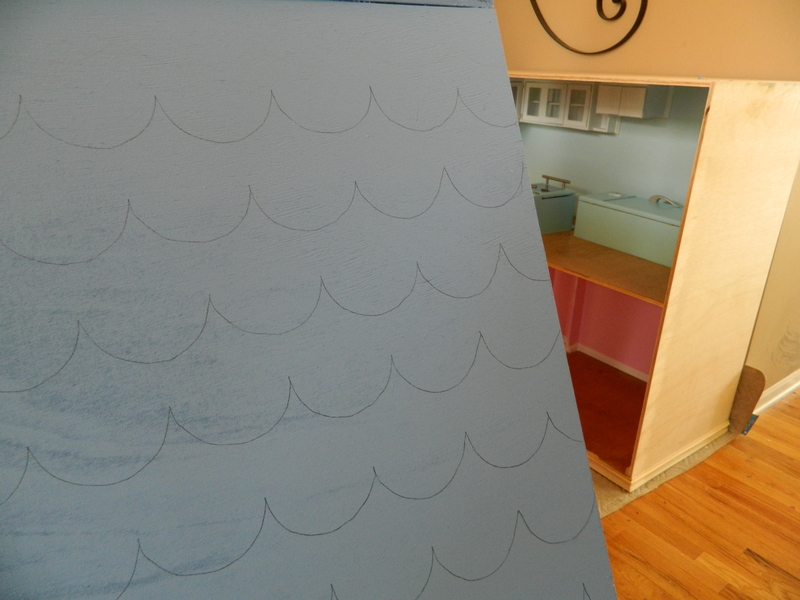 And without having a sample of the paint with me, I picked out the fabric and the color was a spot on match. 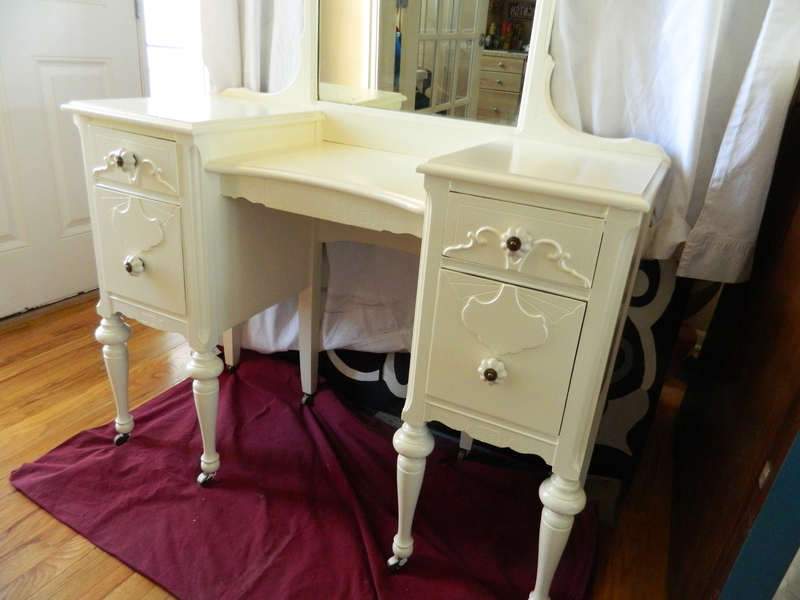 As timing would have it, we picked up another vanity and bench seat! I am in the middle of so many projects… on top of that, I am trying to keep an active job hunt going. 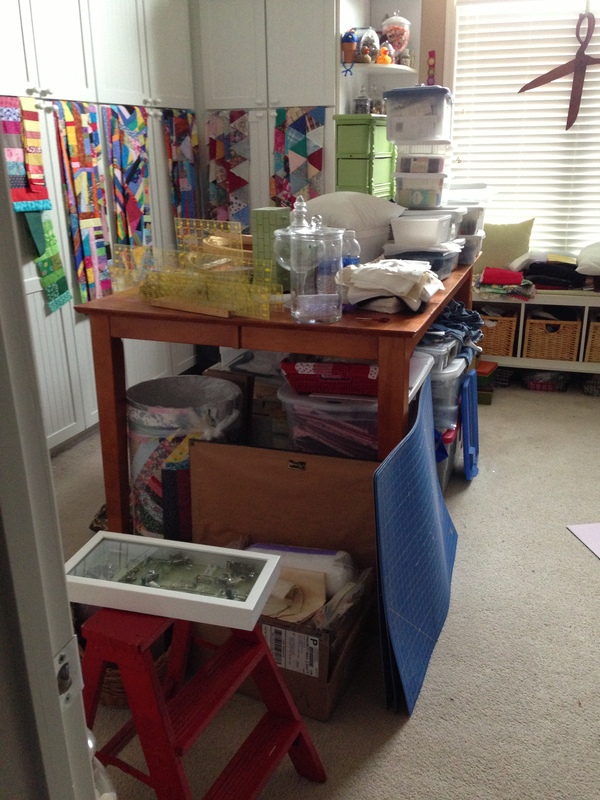 There might just be a point that I would be grateful to go back to work and not worry about how much furniture is occupying my three car garage! 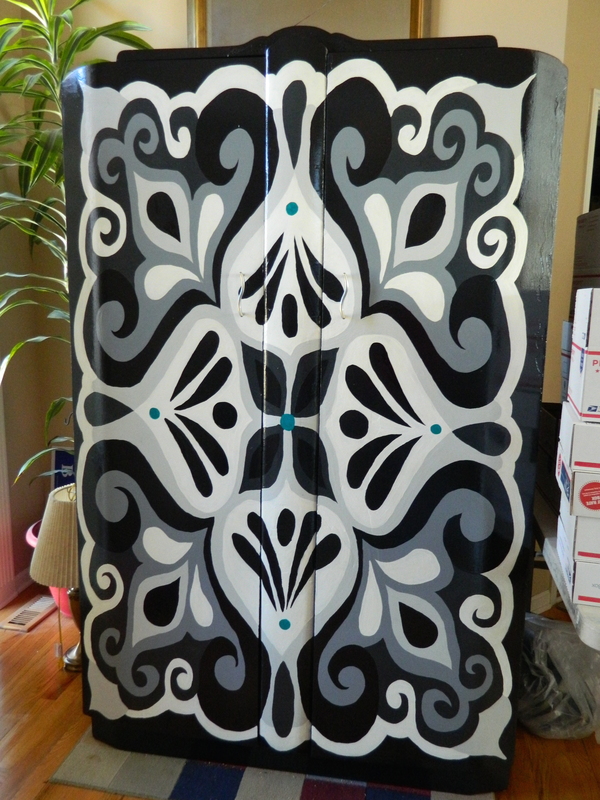 Rescued Wardrobe… Finished At Last! 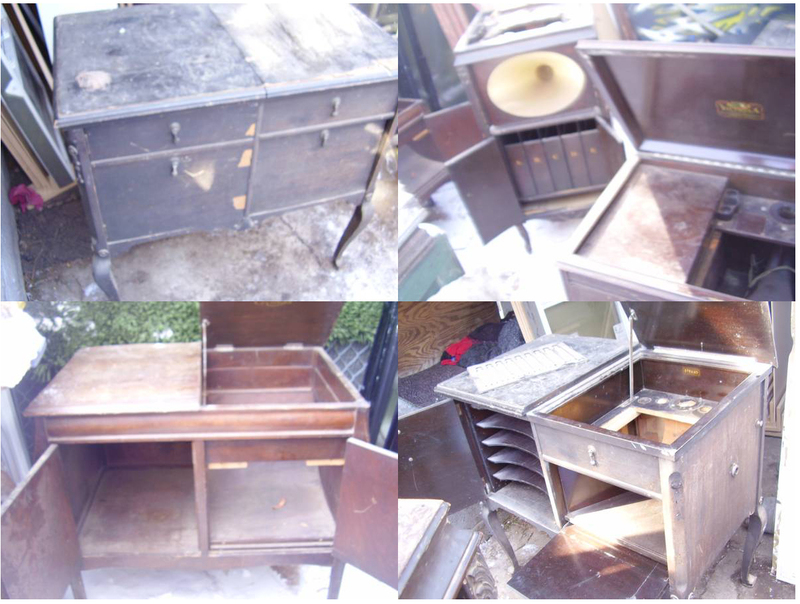 If you’ve been reading my blog, you will remember that quite some time ago, I started work on rescuing an antique wardrobe. Well, since my last contract ended, I took the last push and finished it. Put the handles on it last night and wiped down the interior and took the final photos. So here it is, it all of its black, white and shades of grey. 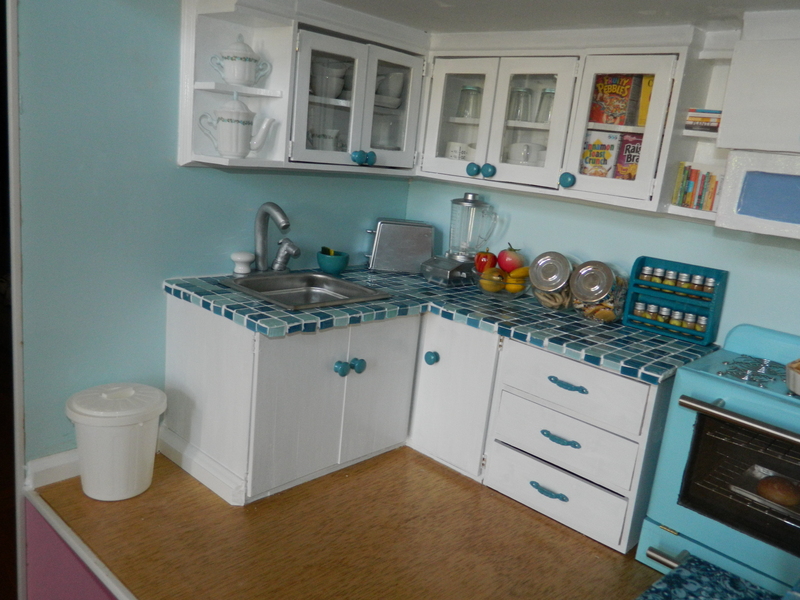 Oh and the smallest touches of turquoise. I think it quite striking and I wish that I had a place to display it and keep it in my home. It is that beautiful. Oh, and did I mention? It weighs like 300 pounds, which means, that me and the Kid gotta pick it up and deliver it somewhere. And if luck holds out, it will be on a second floor somewhere. Whew! I got lucky and the doors open and close easily, no sticking or creaking. 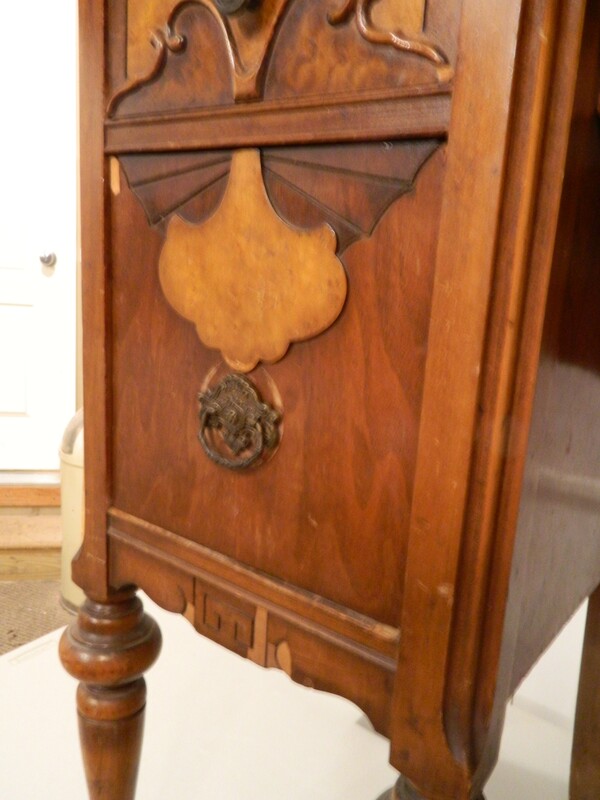 This piece was absolutely a gem in its heyday, it is just too bad that the previous owner left it sit in a garage and made a mess of the walnut veneer. I imagine it was an absolutely gem. As you can see, the interior escaped most of the damage that incurred on the outside. A thorough cleaning of the interior and the replacement of one trim piece and it sparkles like it must have always. Last shot, you can see the multiple coats of polyurethane just shine in the evening sun… I just love the way this turned out. I especially enjoy the color scheme that was chosen. The stark contrast of the black and white with the shades of grey are stunning. 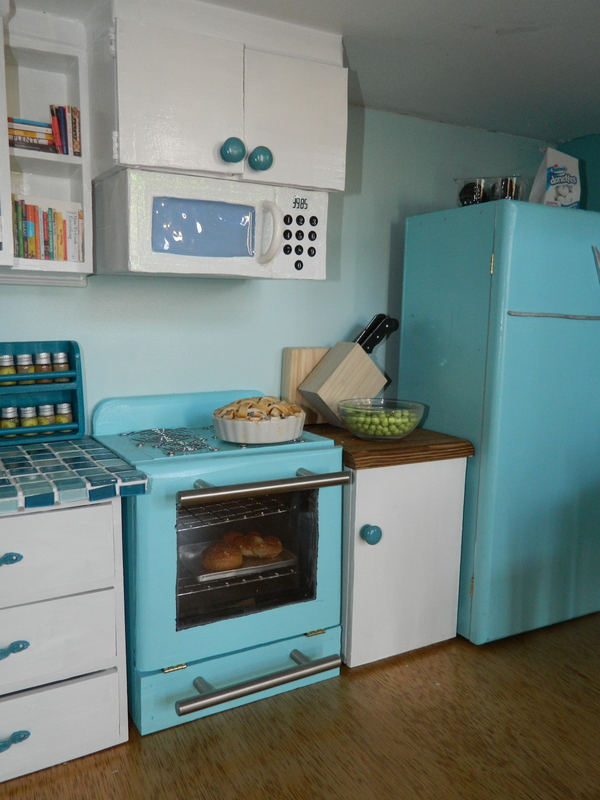 I debated about the accent color, but in the end, I went with a favorite of mine – a deep turquoise. If you care to see the previous blogs, you can see them here, here and here. 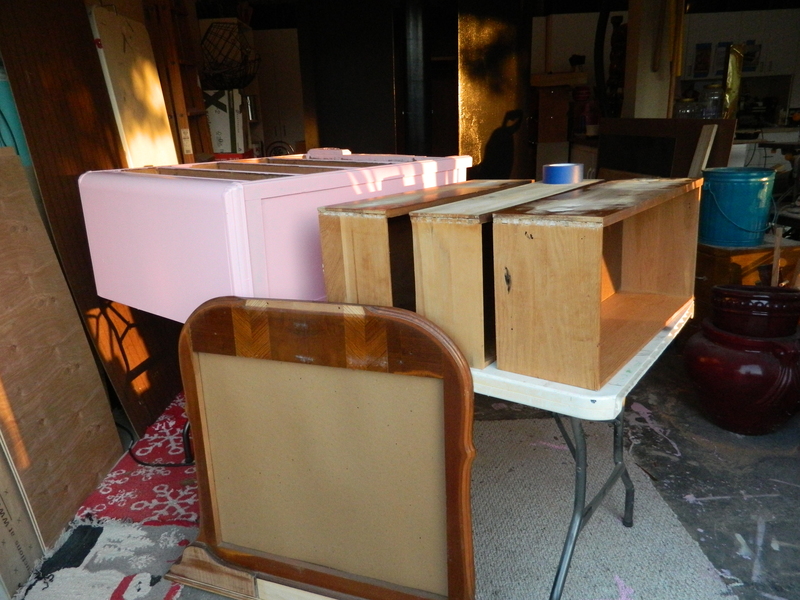 Now, to get them sold and move on to the next projects… picked up these lovely cabinets thanks to the generousity of a gentleman who only wanted the guts of the old record players. I think these will turn out to be very lovely pieces. I’ve also started on the third piece of stained glass, after thinking long and hard, it hit me… it has to be my logo for the doll accessories and clothing and furniture that I’ve been creating. Lends itself perfectly to stained glass. I still have to show you the last one I finished, although I think I realized that the image I chose was much too intricate and am not very happy with the way it turned out. But we can talk about that more in the next blog post. Sliding into home base… we’re this close! Okay, I know, I’ve been chanting this for a few weeks now, but short of a couple of minor details and finishing the play microwave, we are so close. Nothing like a long four day holiday to really get things done. In the meantime, I thought I’d show you the wrap up of a couple of the smaller projects. One is the pair of sofas. I showed you earlier the start of the project. You can see the beginning here. Once I cut it in half and ended up with two smaller sofas, I have wavered on whether to include one or both. 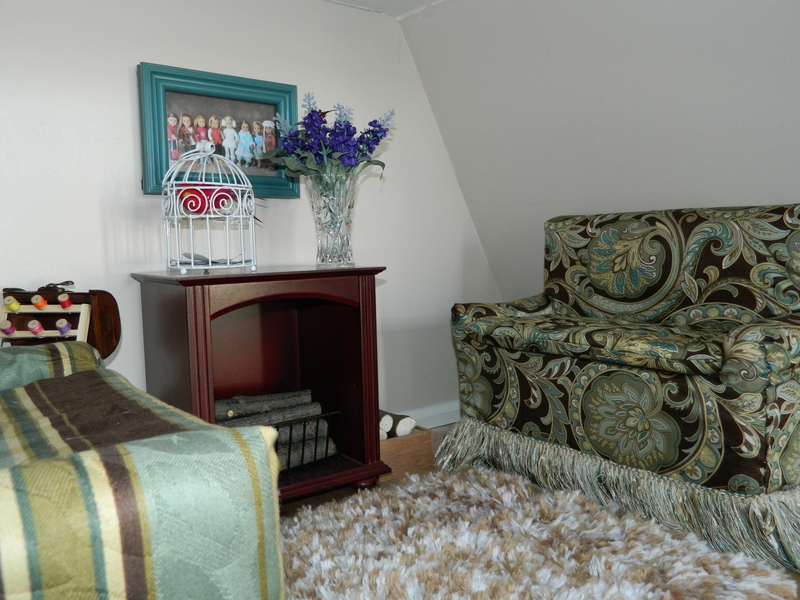 But once I took the pieces upstairs to upholster them, I knew what I wanted to do. I found two pieces of fabric that I picked out earlier for the basis of my master bedroom makeover: pale turquoise and chocolate brown. 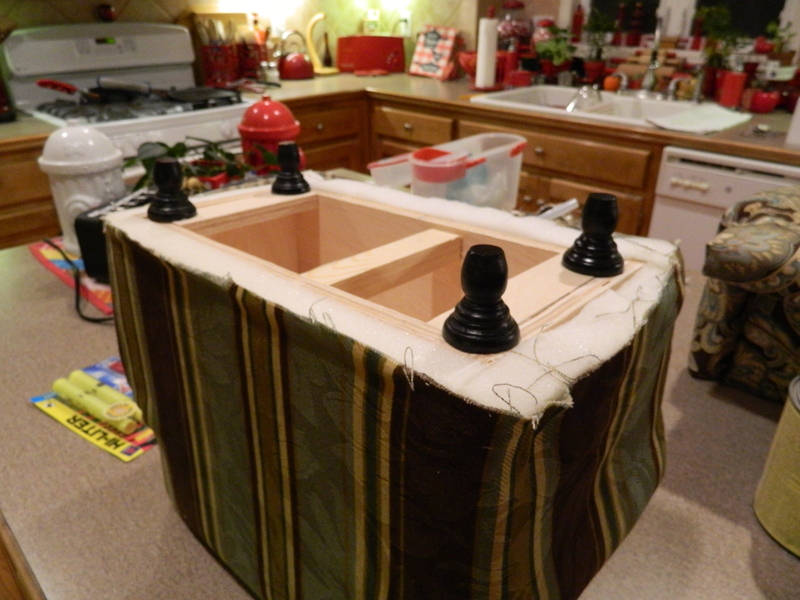 By virtue of trial and error, I figured out how to get the fabric in place. 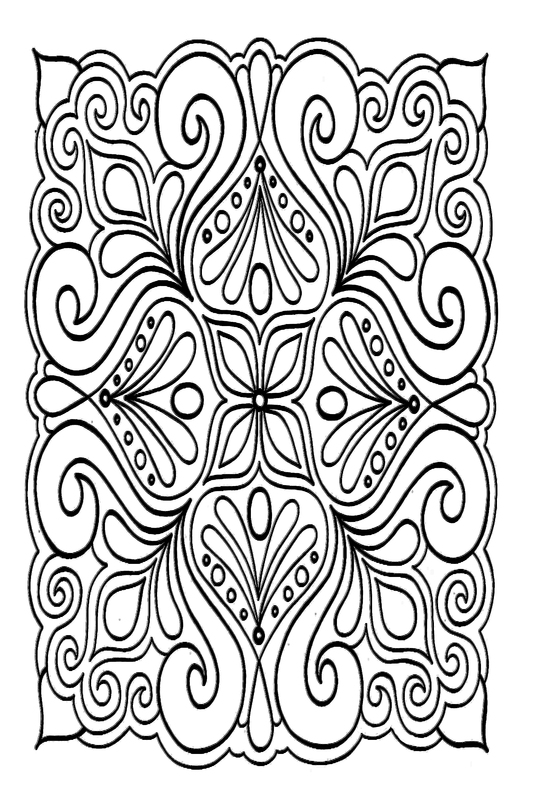 I started with the pattern that resembles paisley and it turned out pretty good. I made a couple of mistakes with the other one (the one with stripes) ending up with a seam in the front and the side stripes being a little wavy. I guess that is the difference between no noticeable nap in a fabric to one with obvious nap! 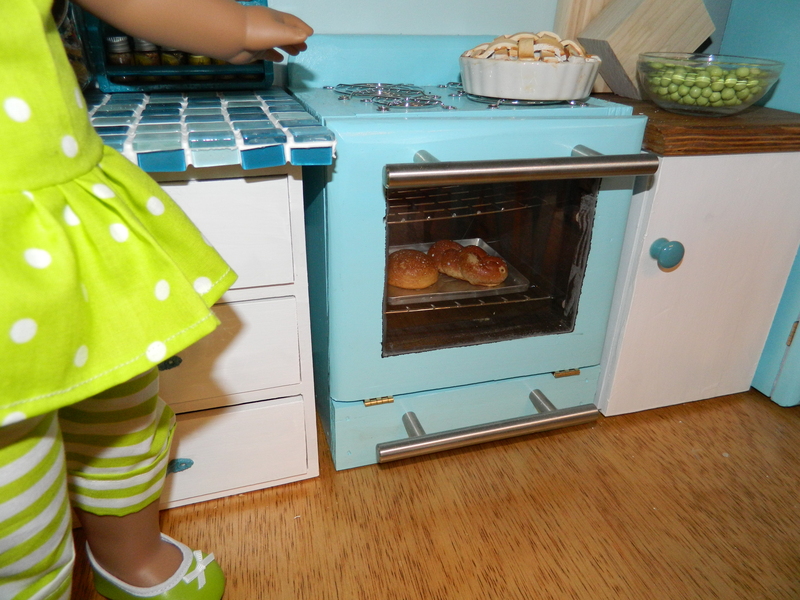 I set them in the dollhouse and realized that they seemed just a little ‘unfinished’. So I decided to add legs to both pieces and a skirt. Now I had enough fabric for the ‘paisley-ish’ fabric, but I really cut it close with the striped fabric, so I decided to do them both the same. Found a nice fringe that matched both fabrics but they had exactly what I needed… it always makes me nervous when I cannot buy a ‘little extra’ for that ‘just in case’. 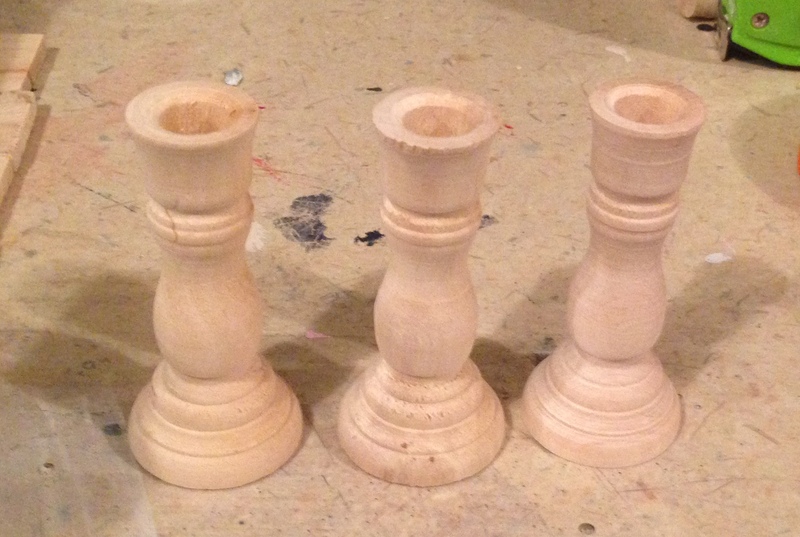 I also found these little candle holders that when cut down and spray painted black, turned into the perfect legs. A little Elmer’s glue and it was good to go. 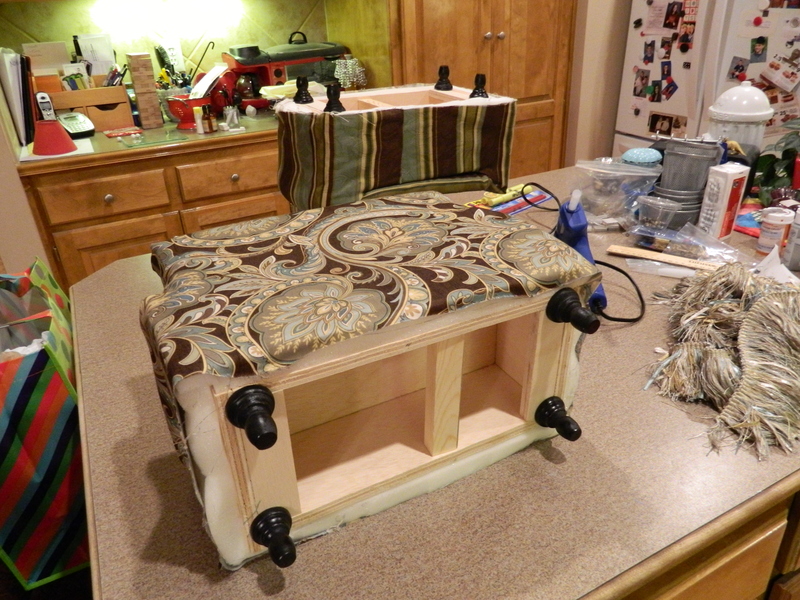 Then, using a glue gun, I wrapped the fringe trim around the bottom. Viola!, I have the perfect little sofas. 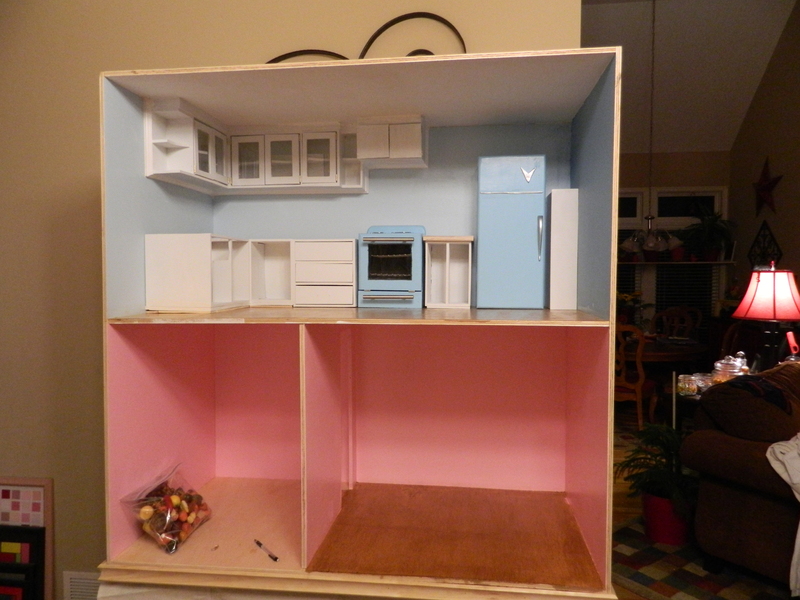 That pretty much wraps up the projects needed to complete the dollhouse. 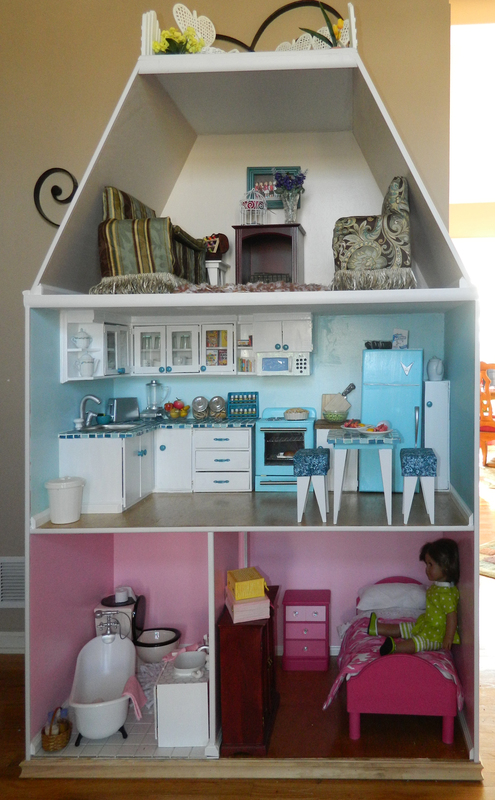 Later this afternoon, once I have all the photos taken, the dollhouse will officially go on sale on eBay, Etsy and my local Craigslist. I am hoping to sell this quickly and then work out the details with delivery. It has been a fun project, but I am so ready to be done and move this out of my entry way and into the home of some little girl and her dolls. Moving forward… slowly but surely. A little progress has been made on the doll house, but no matter how much I accomplish, I always feel like I should have gotten more done. 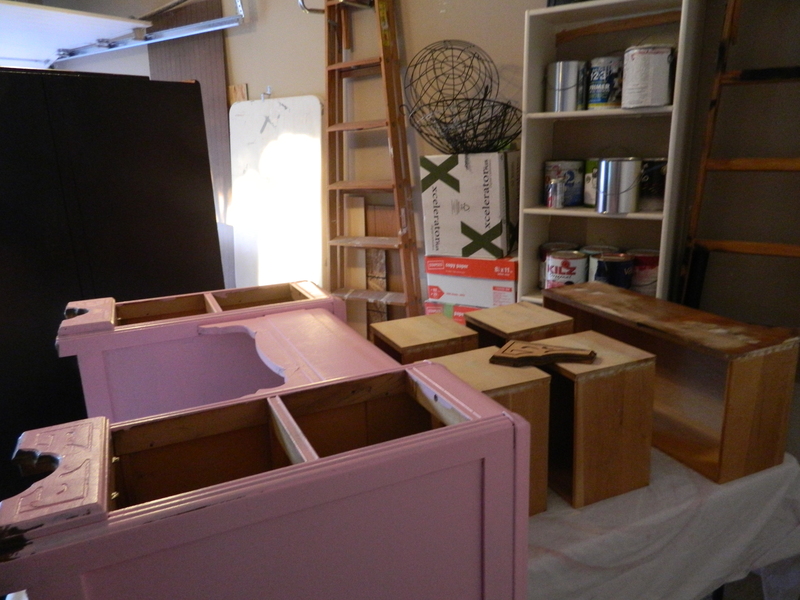 There always seems to be a lot of waiting: waiting for paint to dry, for stain to dry, to find that needed ‘thing’ or get something assembled or installed. Much work has been accomplished on the third level, which is actually a separate piece. I thought ahead and actually painted the interiors before we assembled it. 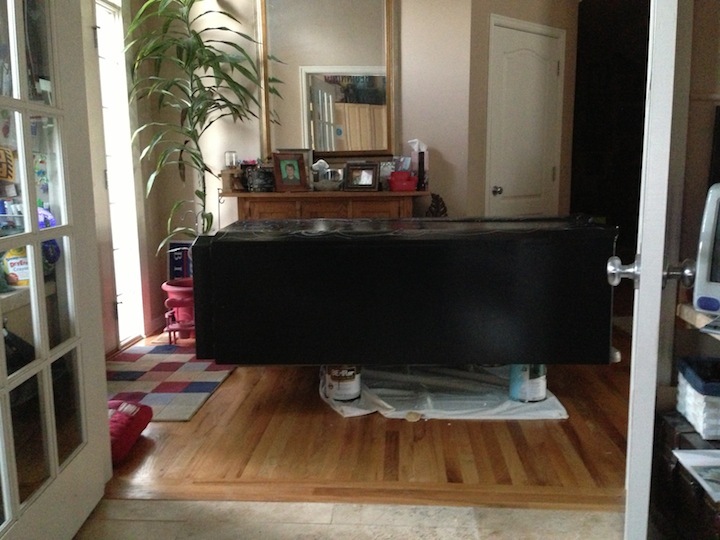 No funky corners or angles to have to paint carefully and not worries about the flooring stain and the walls latex would interact. 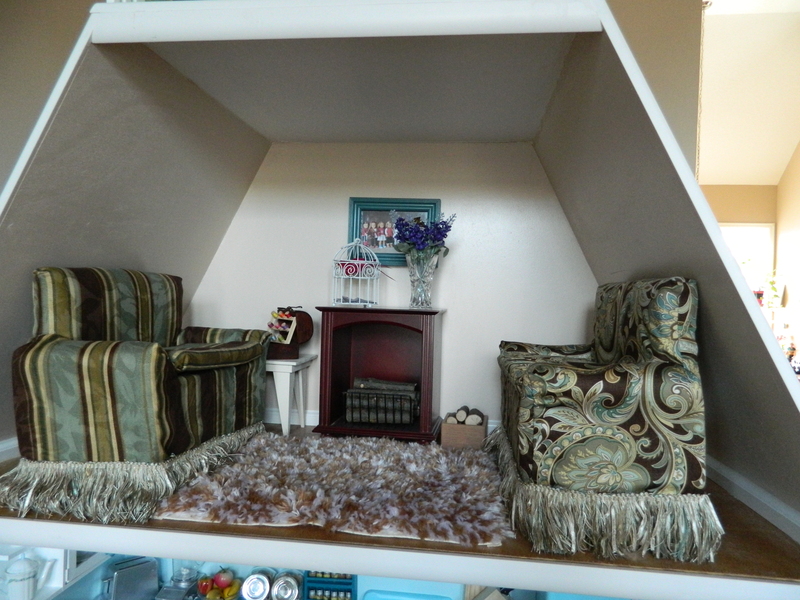 I opted to not make a peak in the ceiling line and rather have a flat space on top. 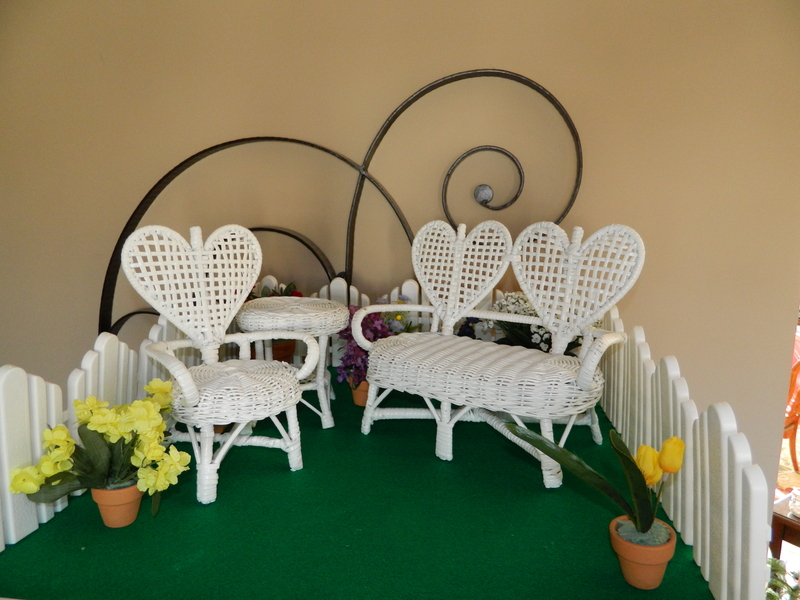 I think I am going to put a railing around the edges and use like an outdoor patio. 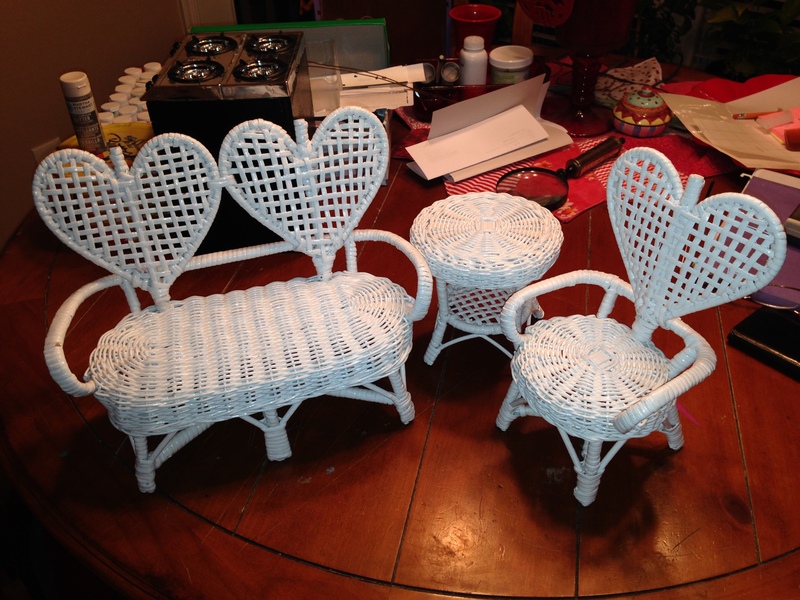 I picked up the most awesome little wicker set that will just be wonderful there. I think I want to install outdoor carpet (or what looks like it) and then scatter a bunch of small planters with flowers behind it. Isn’t that little wicker set just darling? 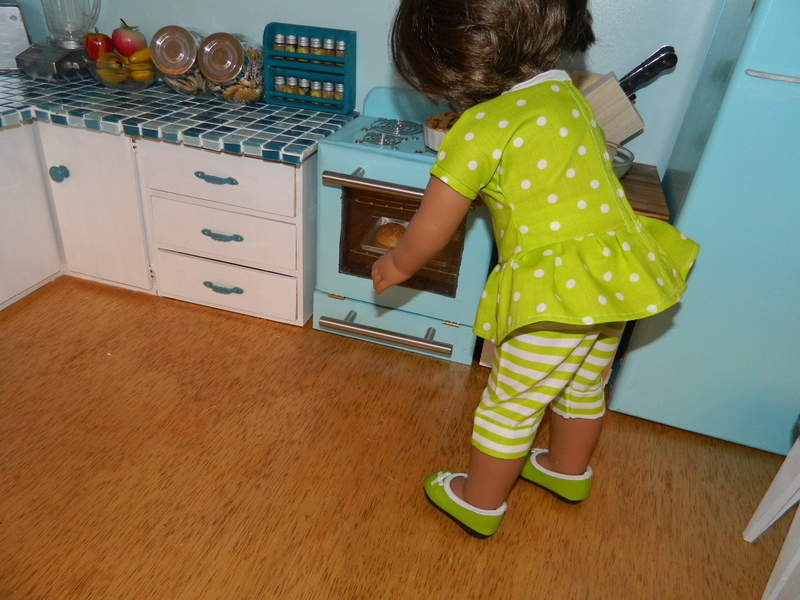 I have no idea what the original purpose of that set was, but it is perfect size for the 18″ dolls. It was just happenstance that I ran across it on one of me and the Kid’s ‘thrifting’ afternoons. Speaking of waiting, here are the floors for the bedroom and kitchen, finished with two coats of oak colored stain and then two coats of polyurethane. I just love the way they look. The plan for the bathroom floor is black and white checker board tile… I just hope that it doesn’t add too much weight to the overall piece. To help prevent grout cracking, I am going to use flexible grout. 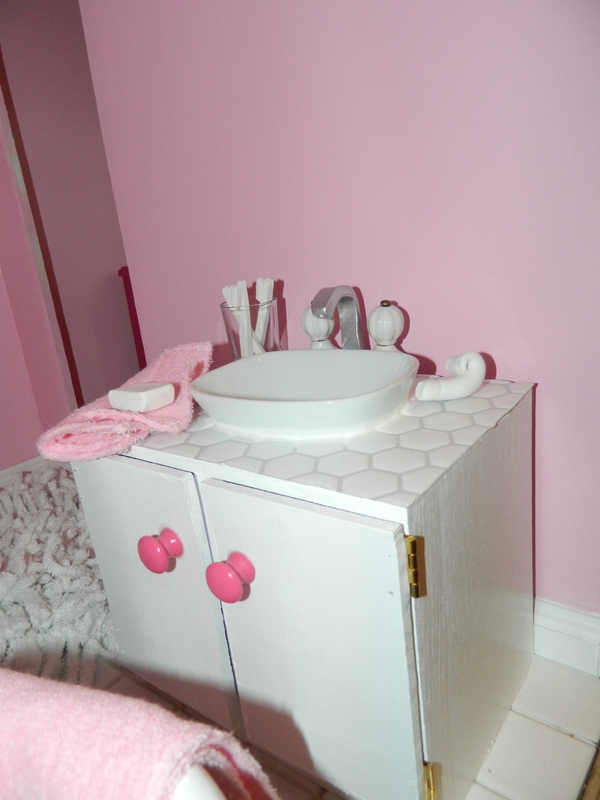 Won’t a pink bathroom with black and white tile just be the cutest? 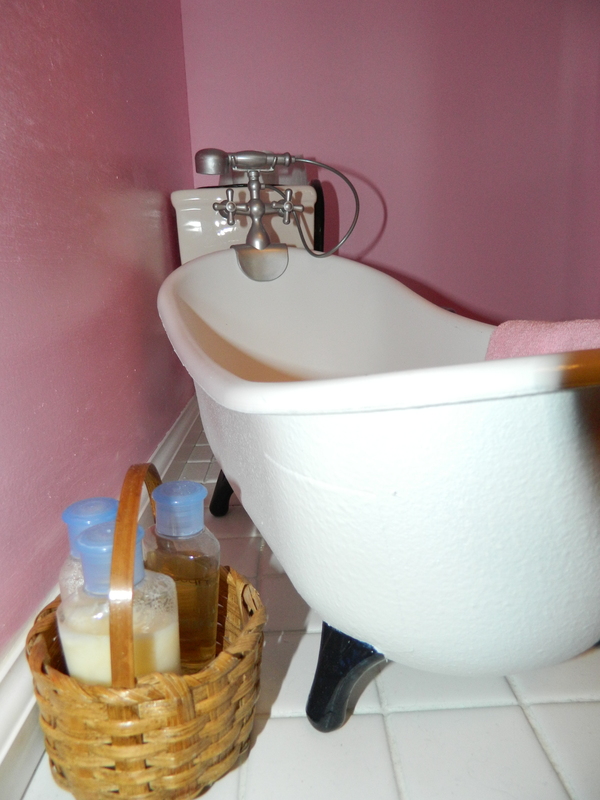 I have a little claw foot tub ready to go in and have already made the sink and vanity. 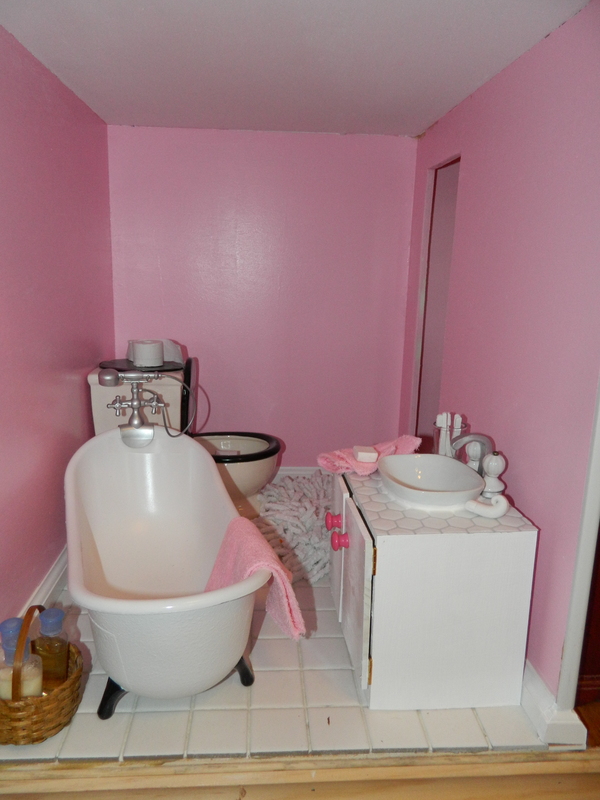 And of course, a toilet! 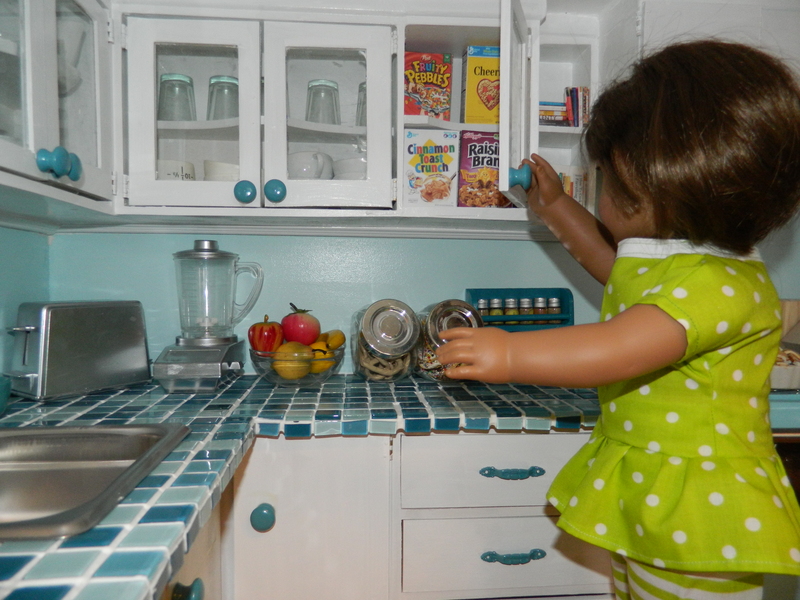 I’ve started fitting in the lower cabinets and have set the range and refrigerator in to check for spacing. 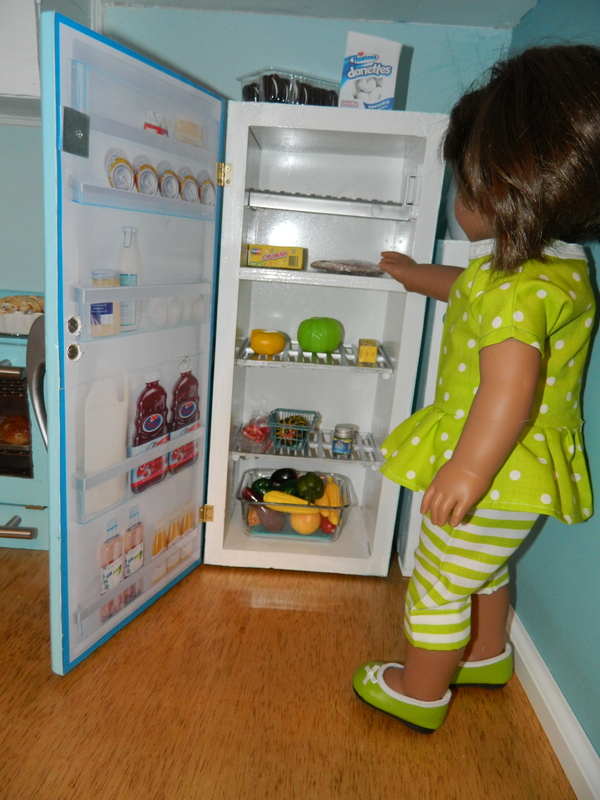 In the corner next to the refrigerator is a small narrow cupboard. There is a part of me that wants to rebuild it a bit taller, but again, I don’t think it is absolutely necessary. You cannot begin to believe how many accessories I’ve purchased, created, made or found to make this house complete. I am feeling like I am turning a corner to having this done. The hope is that it will be done soon, making it a perfect Christmas gift for some special little girl. 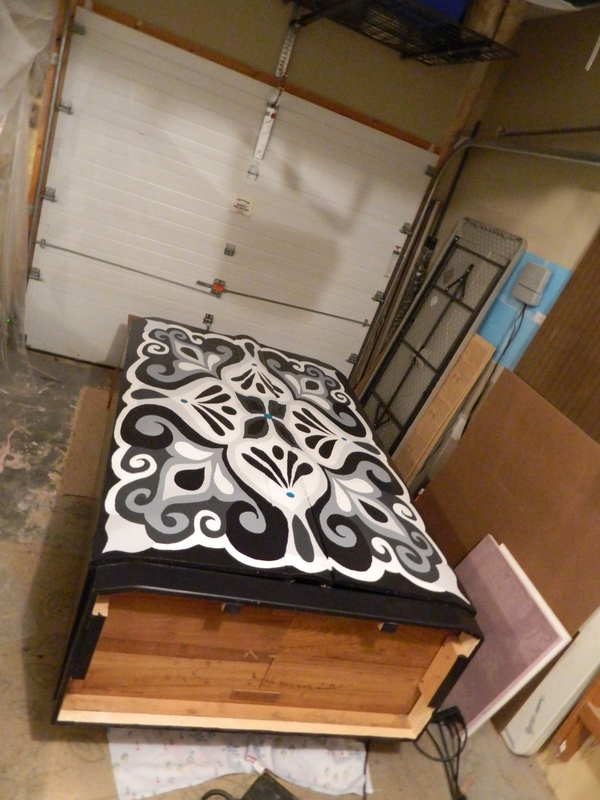 As to the other project – the large black wardrobe – has had progress. I’ve finished all the touch up on the black, white and shades of gray. 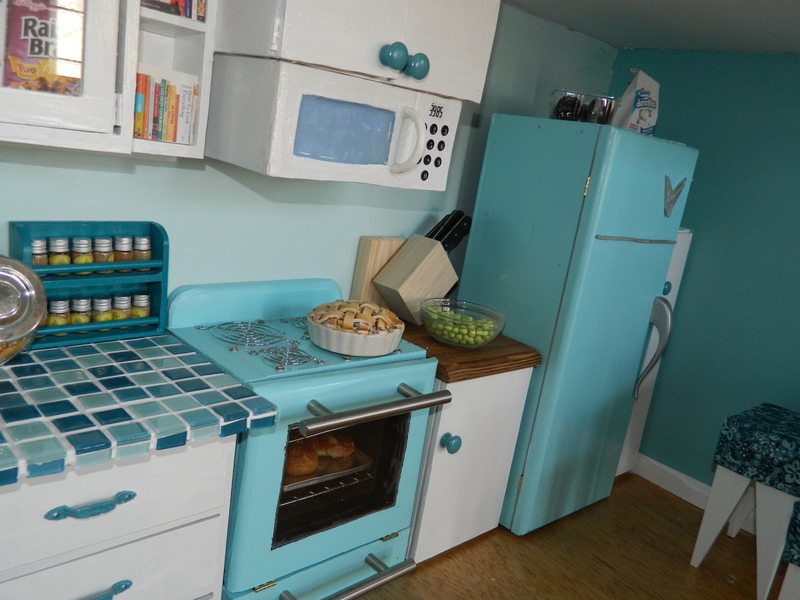 I settled on the accent color of turquoise, and used it sparingly. Also, in the end, if I decide I would like a different color, it will be easy to change. Next step, wait for a warm day or two (or figure out how to warm the garage) so that I can apply two or three coats of polyurethane. I can’t wait to see it completed. Although the interior still needs to have a good cleaning with Murphy’s Oil soap and one or two pieces of trim to replace. This is turning out quite beautiful, if you ask me! What happens to it when I am done still has not been decided. Its a bit hard to see, but the center dot as well as four dots are the only spots of turquoise. Everything else? Shades of black and white. Oh and you’re looking at the rebuilt bottom, no sense in painting that, when it will never be seen. One last think I wanted to throw in at the last minute. Autumn has definitely fallen here in the Midwest. We bought this house 9 years ago and the grand total of trees on our over sized lot was one lone oak in the backyard. Over the years we’ve planted many more, but the two in the front yard have just surprised us with their growth… these trees were about 4 foot tall and no bigger around than a pencil. 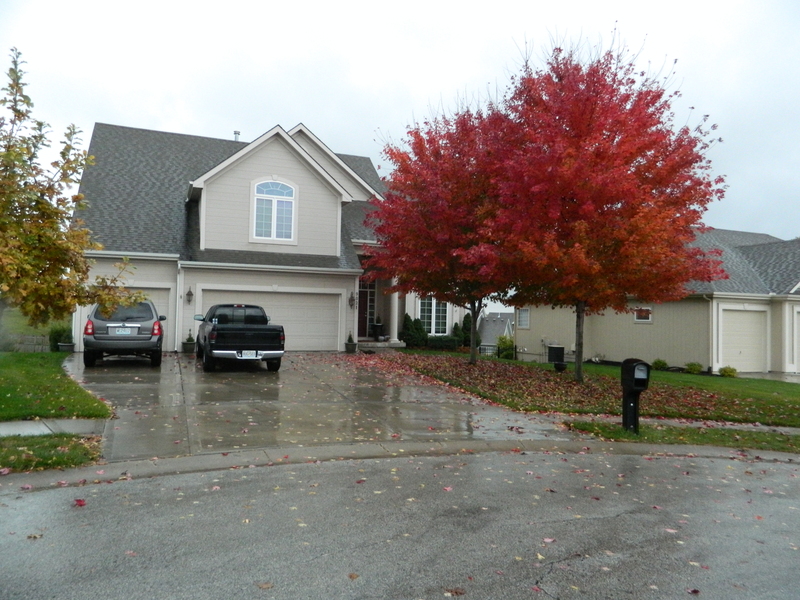 And the fall colors in their leaves made me stop and take a photo on my way into the garage the other day. Too bad the color doesn’t stick around very long. Or that someone has to rake them up eventually! I sometimes forget just how lucky and blessed I am. I hope everyone takes a moment and counts their blessings too. Lots to talk about, things making progress but seemingly like getting nothing accomplished. 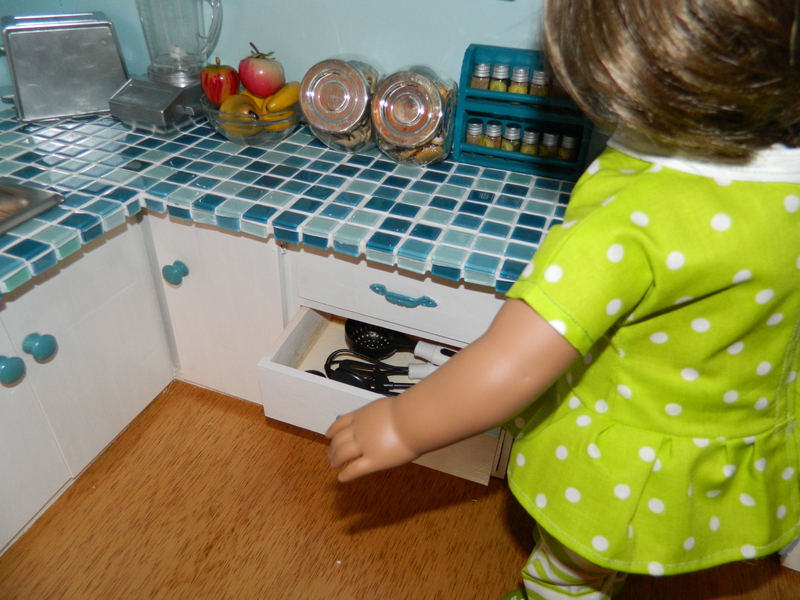 Making steps on the dollhouse, getting an inventory for the doll accessories and clothing sale and finally making visible progress on the wardrobe. I’ll give you an update on the wardrobe re-do, since I had the Kid take pictures 🙂 Since it takes up so much room in the foyer, it is difficult to get good photos, but since I have a landing on the second floor that overlooks the entry way, pictures are much easier that way. So, first, I opted to go with the black, white and shades of gray. 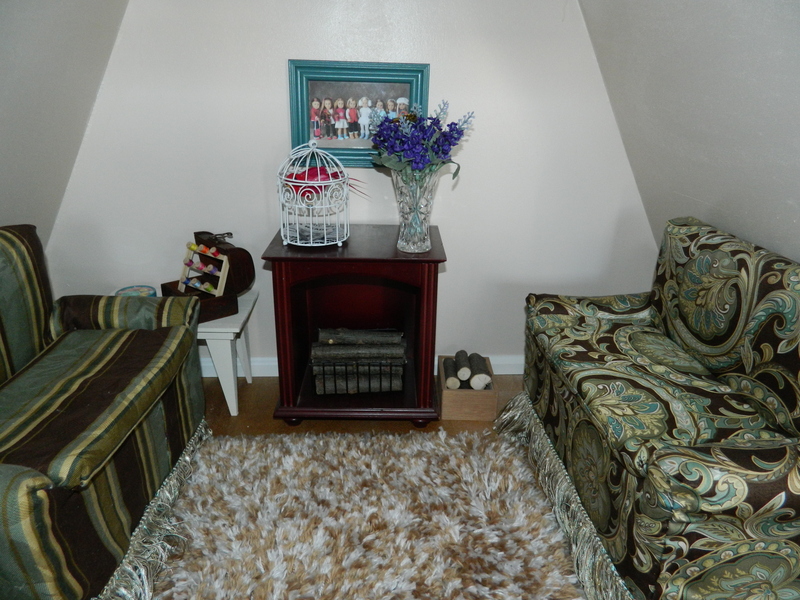 I had a lot of paint leftover from the ombré gray dressers back a while and the color scheme did get the most votes. Although no one color got many votes, it was the one I liked the most and if it comes down to it, it will go in just about any color schemed room. I did redo the shades of gray ever so slightly, since once I picked up the brush and the first color, I realized about half way through that I had started in the wrong area! Whoops! So, I just cleared them and started again. I just finished laying down the second color and I think I am really starting to see it coming together. And really am liking it. Right now the paint I am applying is flat, but once I am done, the whole art is going to get a couple coats of polyurethane and it will all be back to a nice gloss. Again, remember, that the interior is still a beautiful walnut and will only require a deep cleaning. I am getting excited about this piece. Even if it is breaking my back to lean over it to paint. So, without further ado: There are a couple of reflections at the top from the light, makes it look a little weird. Again, from this angle, you can tell just how massive this piece is and how much of an impression it is going to make in whatever room it ends up in. Okay, the weather has turned ugly outside and I think that we are going to unplug the network to avoid any voltage surges; we had a lightning strike right outside the house about a year ago that fried the network modem and a power surge protector and don’t want to take any chances when it comes to my computer equipment (did I ever happen to mention that I am a software quality assurance engineer at my day job?) and between me and the Kid, we have lots of expensive toys. Thanks for dropping by, stay warm and dry and come back soon! Color Condendrum – Your Vote Counts! 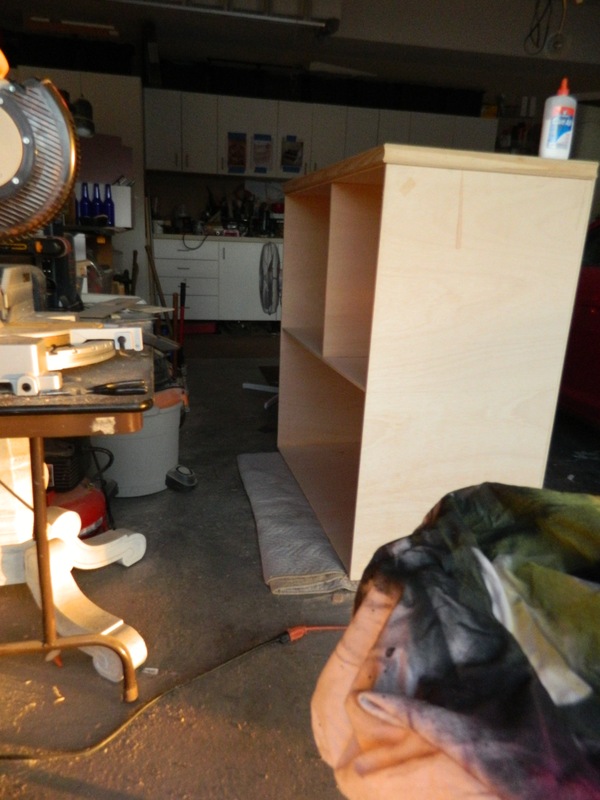 I’ve been slowly making progress on that large wardrobe I picked up off Craigslist. It had been a beautiful piece at one time, but when it was handed down, the person on the receiving end either didn’t want it or didn’t know what to do with it. As the story was told to me, it had been relegated to the back corner of a garage, and there, the weather and other elements took its toll on the facade. The interior was – is – gorgeous and will only require a deep cleaning and a wood conditioner (and a couple pieces of missing trim), but it is the outside that has plagued me. 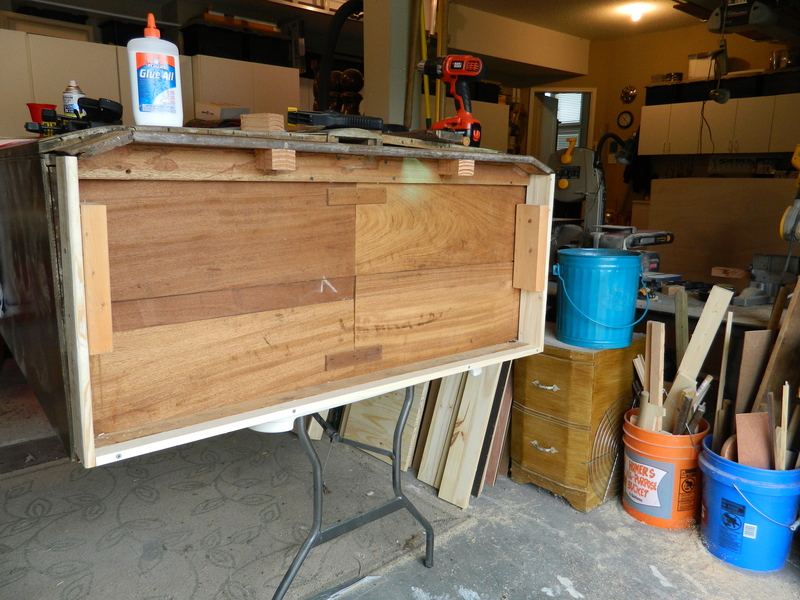 The two broad doors had been layered with walnut veneer that I cannot find to replace it, that is, even if I knew how to work with a veneer. It, too, took a corner position in my garage for a while, as I pondered alternatives. Finally, I opted to fill the sparse areas with wood filler and sand it all, then over the course of several months applied my favorite ‘deep space’ black. 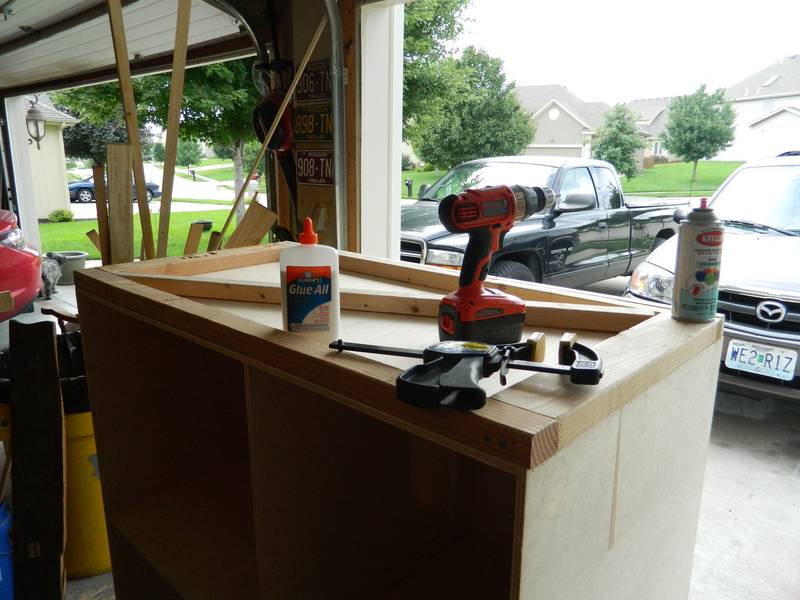 My son had done a fantastic job of building a replacement footer and shoring up the overall cabinet, now a strong and sturdy piece of furniture. 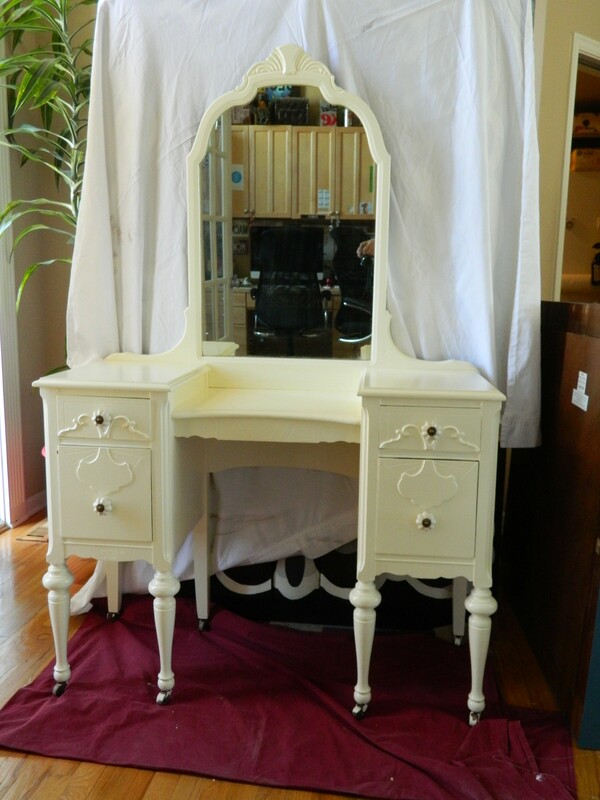 I had been doing (as I do a lot) browsing on the web for interesting treatments to these massive pieces of furniture. 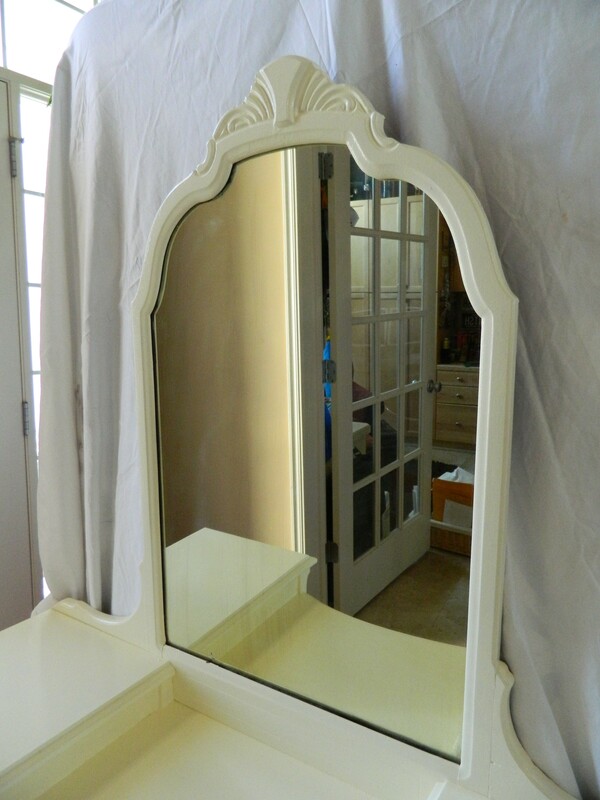 The very size of it indicates that whatever room this eventually resides, it will be a focal piece. So I knew it had to have a special treatment. I’d love to show you some of my early influences, but for the life of me I can’t put my finger on it. Gah! Hate when that happens! Anyway, I tripped across some abstract painting and fell in love with one in particular. You can see her work here. I chose a piece out of her coloring book that she sells on her website and with a little resizing (the wardrobe isn’t square) I was ready to get to work. I used an old school projector that I got for free off Craigslist and by simply cleaning it, it was fully functional. 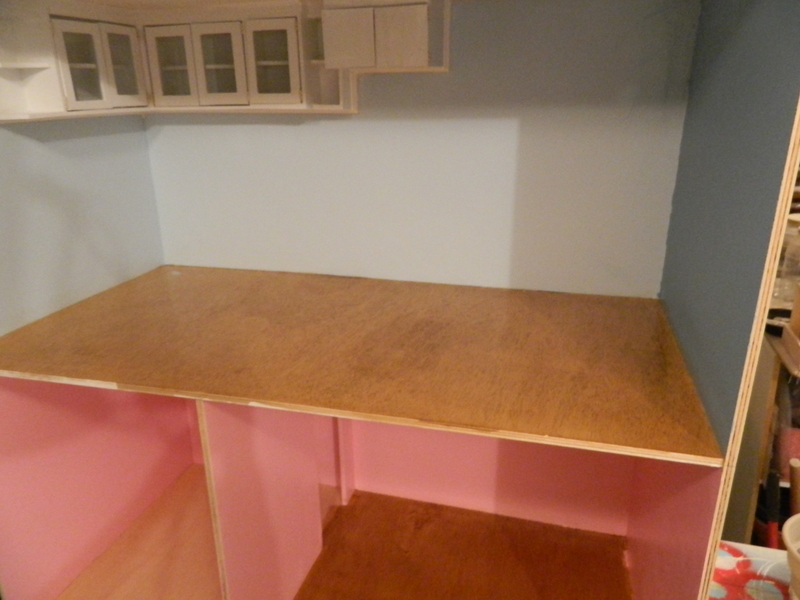 Obviously that never stops me, so I had to paint it a much cheerier color than that dismal office desk gray. So I printed the design onto a piece of clear transparency film and simply used white paint pens to mark the edges. 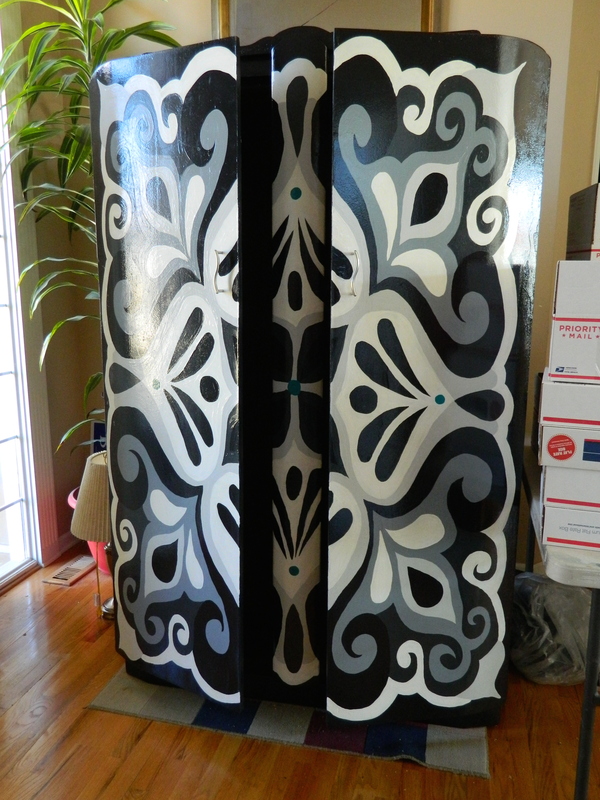 The first try I was a little short – the design didn’t cover the doors – so another couple of layers of black paint and I was ready to start again. While it was sitting in the garage waiting to be remarked, I tried to envision what colors I would use. 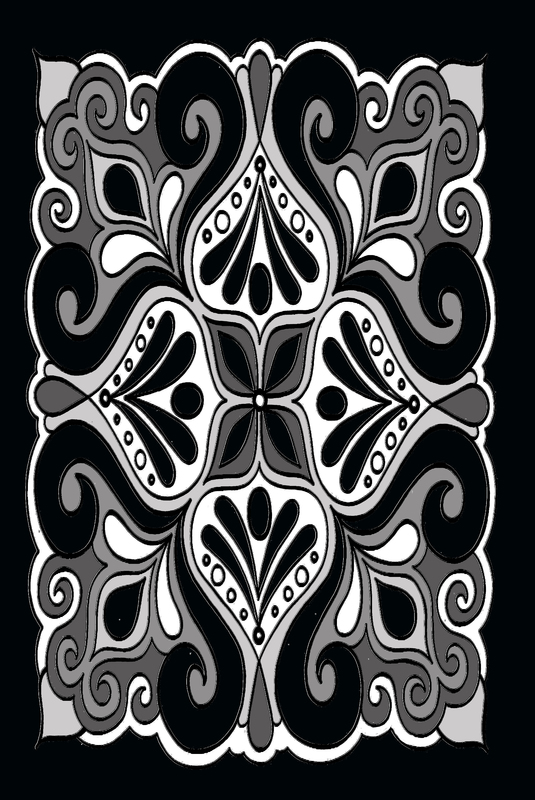 There was a part of me that thought that the white against the black was unique enough, but the lines are a bit messy and I am not sure that I want to do something so ‘colorless‘. This is going to be hard to ignore. 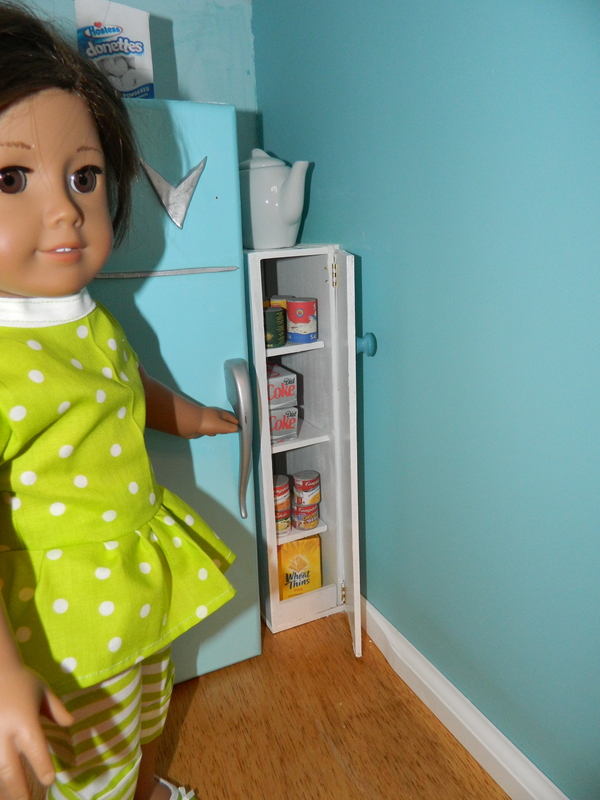 Work continues steadily on the 18″ sized doll house and the play pieces, furniture and clothing to go with it. The Kid is working on my logo and the web site colors and today we shopped for the new backend server computer. We’re going to be running SQL – this will be my first experience as a DBA and hopefully will hone my SQL skills. While we were shopping, we stopped into the local computer recycling center and then had an honest-to-goodness LISA there. As I was oohing and ahhing over it, the guy working there said rarely does anyone recognize it. Even though my experience with Mac computers go back a ways, it didn’t go back that far, but I admire that our sleek new iMacs and MacBookPros had their humble beginnings with this computer. My son found a G4 MacBook in excellent shape to, so for historical sake and to help my son see what we once thought was the biggest and baddest. He’s been installing the OS and games and apps for the better part of three hours now, so I think he’ll at least use it enough to get the $40 price tag’s worth. Okay, signing off for now. 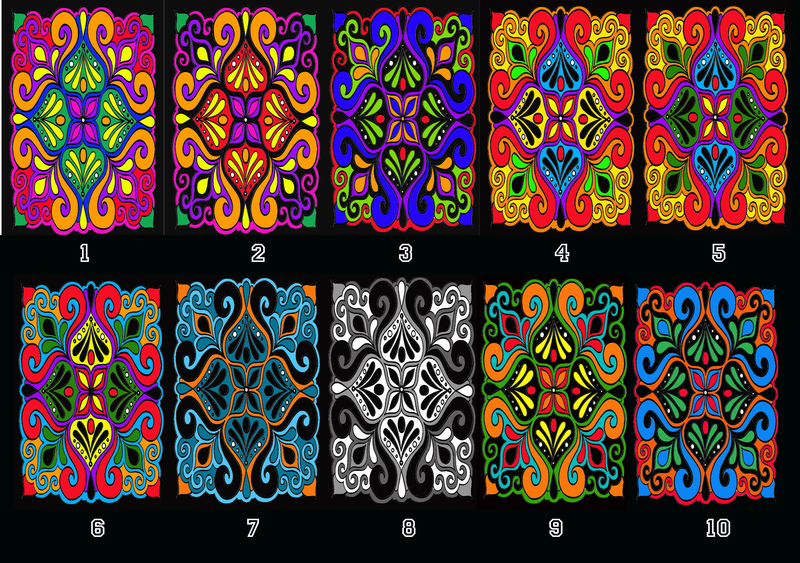 Come back soon and don’t forget to vote on your favorite designs! Its been over a month since my last post. I did not realize that when I went back to work full time that it would eat into my creating so much! With the commute and the new (old) technology that I am having to learn, it really exhausts me so that when I do get home I don’t feel much like doing anything! But I have been working on a few things. 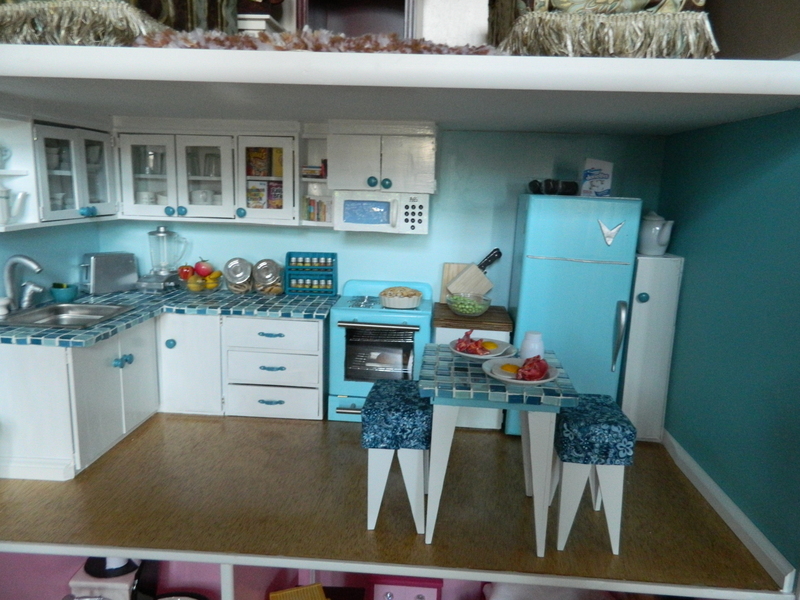 Primary focus is on the ultimate American Girl dollhouse, but it always seems that lots of thing take priority over it. One such project is this beautiful pair of waterfall bedroom pieces. Finishing these pieces will help fund additional projects. 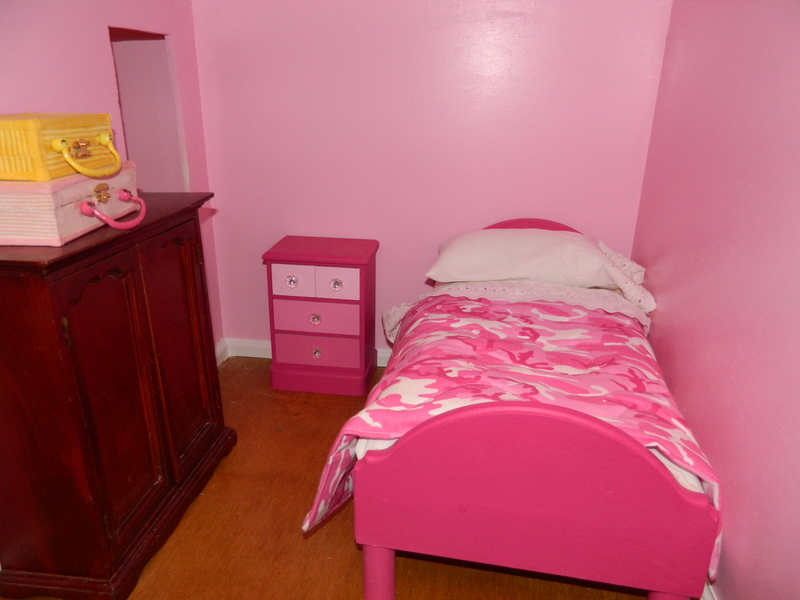 Sometimes I wish that I had had a little girl so I could decorate a girl’s room. My luck would have had it that I had a little girl like me who rebelled against being ‘girly’! I found the handles at one of my favorite places, the Habitat for Humanity’s ReStore. They are interesting in that there is a twist in the handle and the middle twist has a nice little texture. 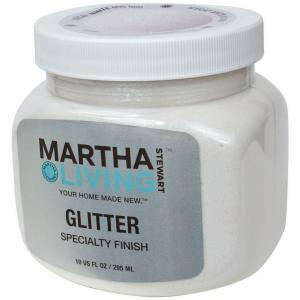 I spray painted them a soft satin white and then applied several coats of Martha Stewart’s glitter paint, giving the handles a sweet little shimmer. Kind of hard to see in the photo, but it turned out nice, I think. 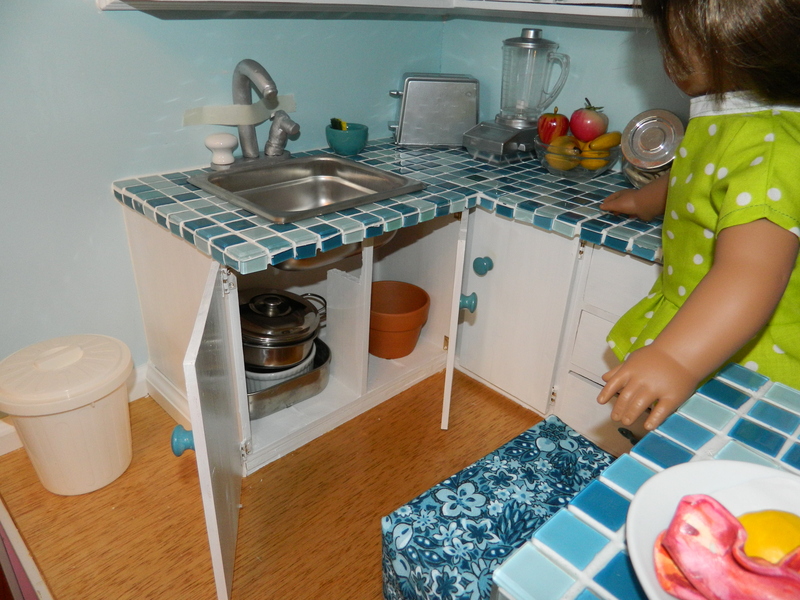 So, the work on the ultimate American Girl dollhouse. 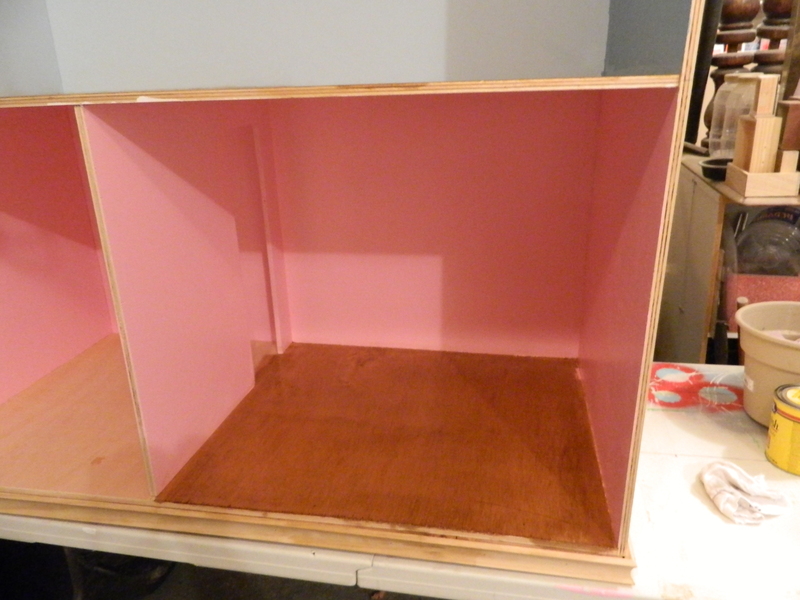 Here is the box finished with the added trim. 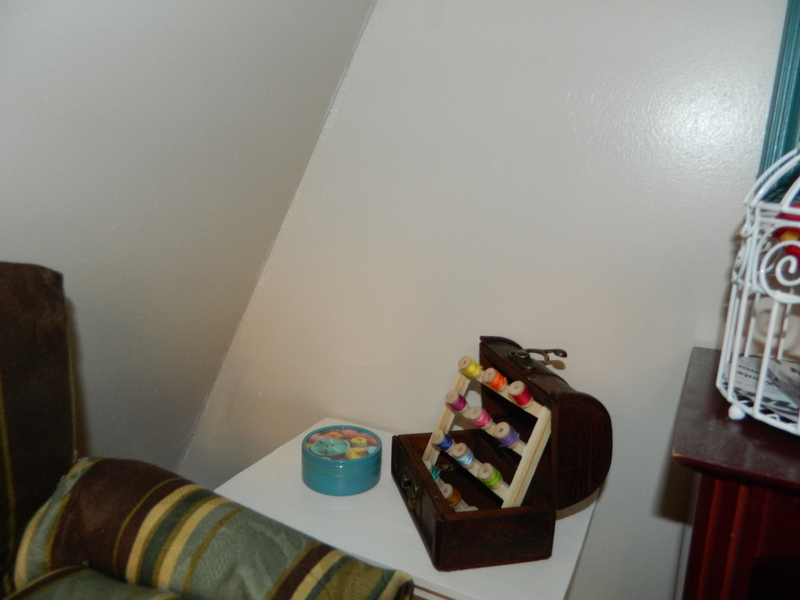 I’ve divided the bottom portion into two rooms, the wall with a door, such that it will be a bedroom and a bathroom. And other than working on the small accessories, this is about as far as I’ve gotten. This picture shows the wall inserted. 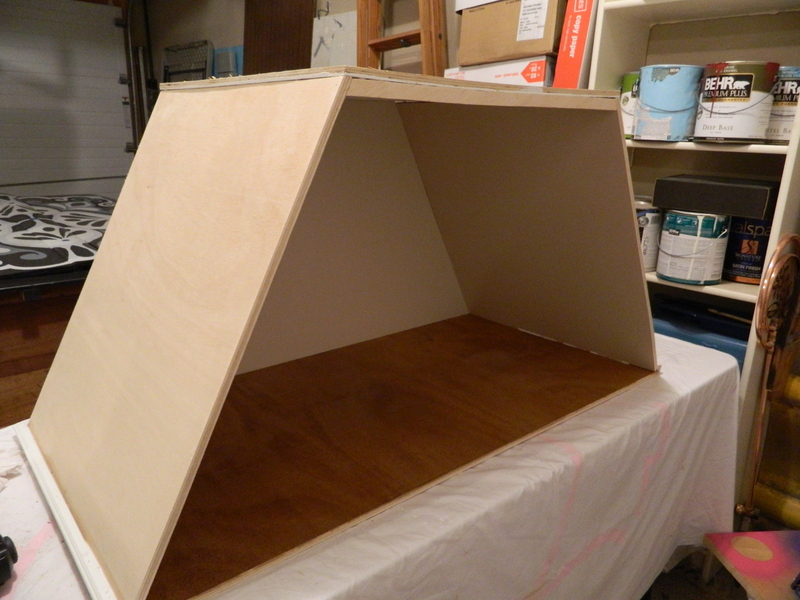 Upside down, added the bottom structure and trim… we’re making slow progress. Also the work on the wardrobe continues. Wow, this one is taking a lot of effort and time. I never seem to have much time to work on it and it is going to take a a lot of work. I am convinced that this is going to be magnificent though and is destined to be a piece that I keep. Okay, gotta wrap things up for now, gotta get some sleep and get ready to do some serious SQL testing tomorrow. I think it is really going to fry my brain before I am done with work’s project.